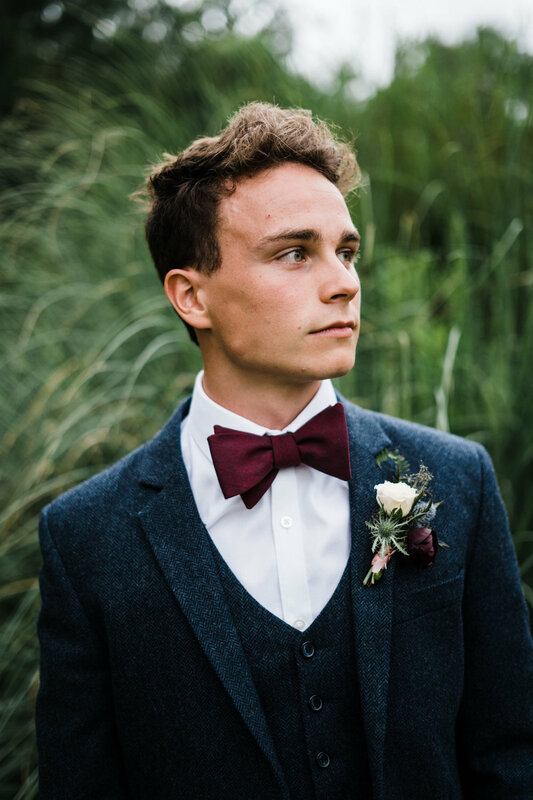 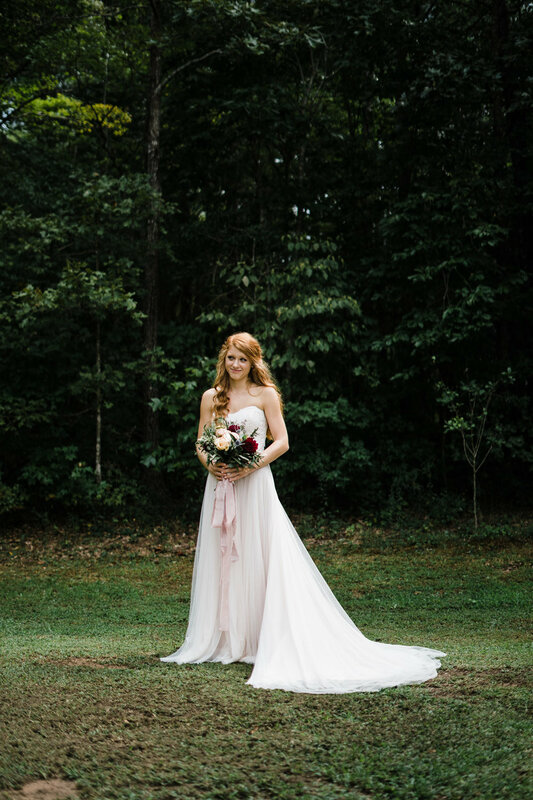 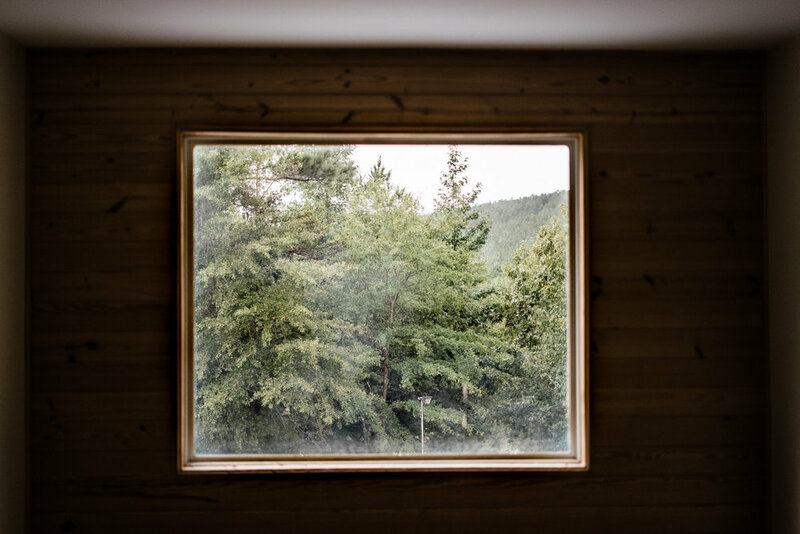 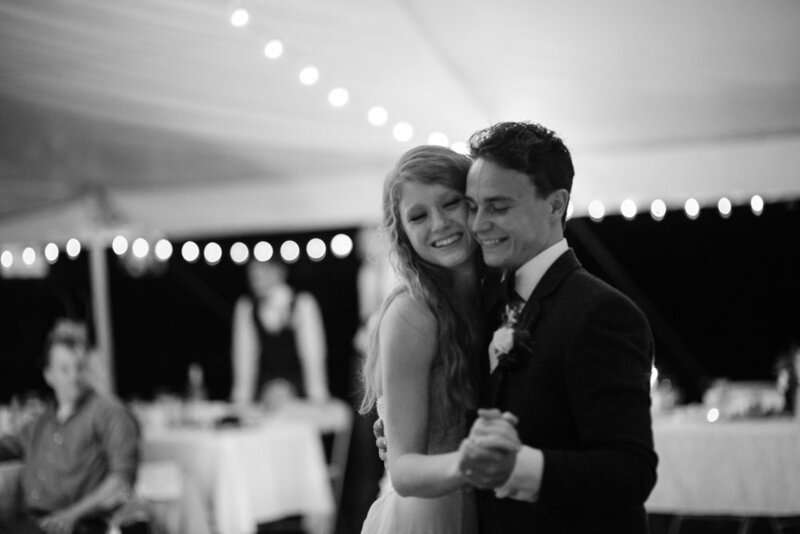 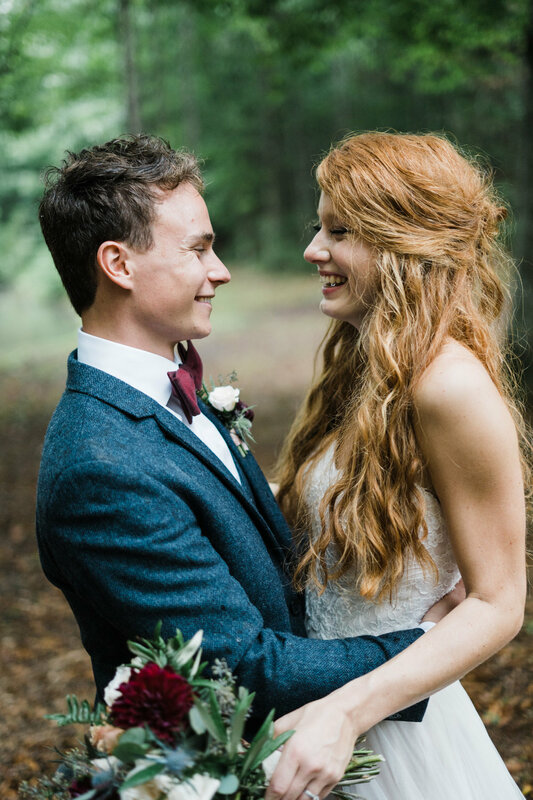 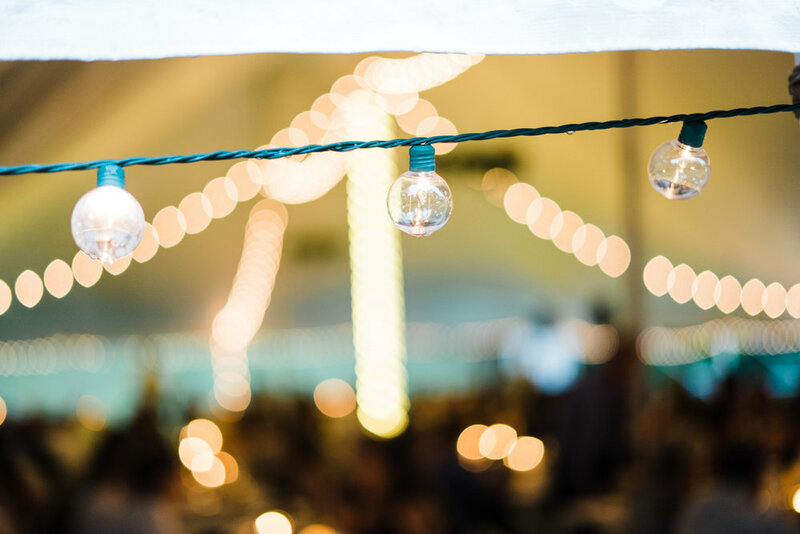 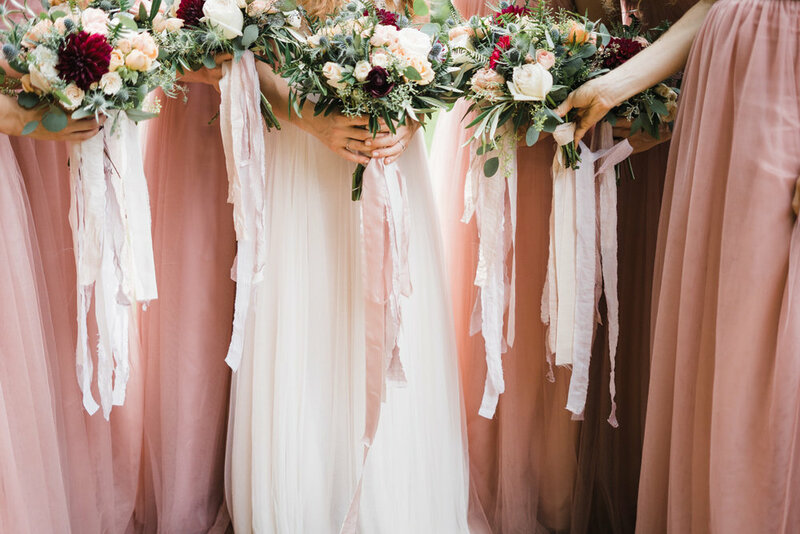 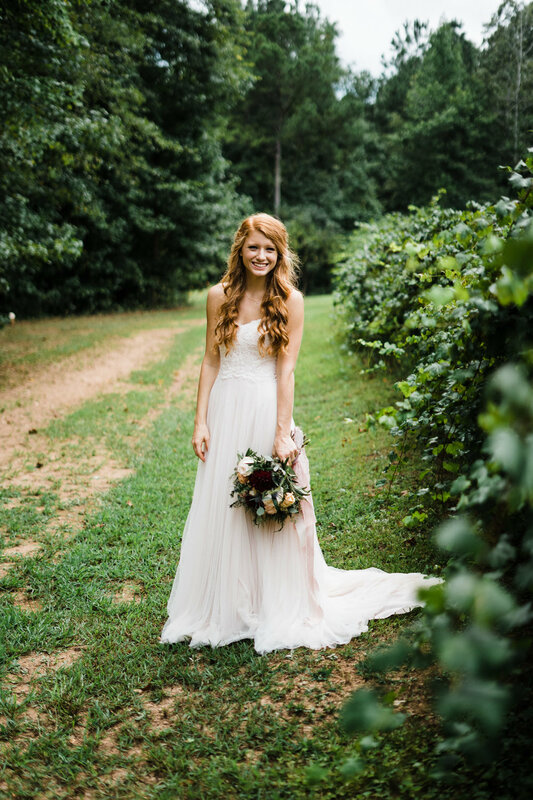 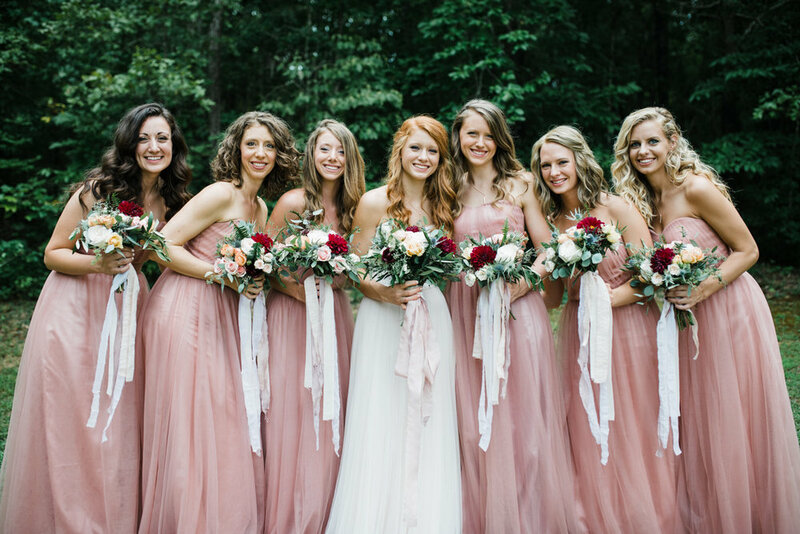 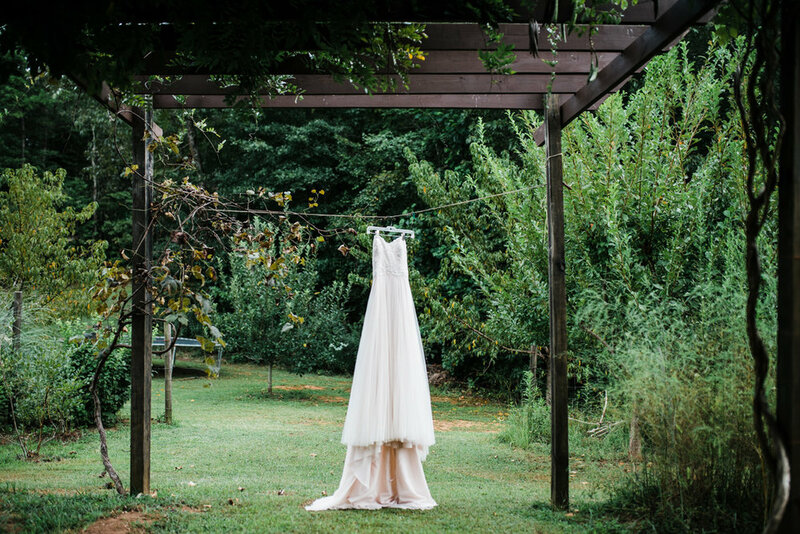 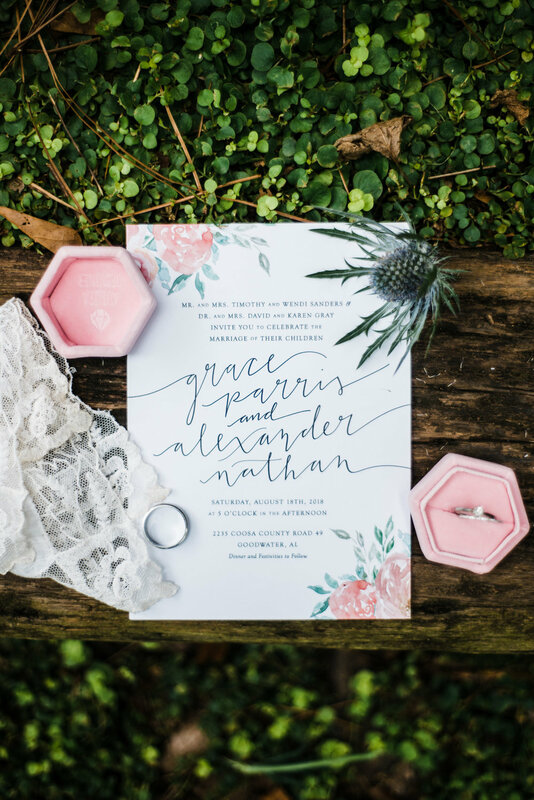 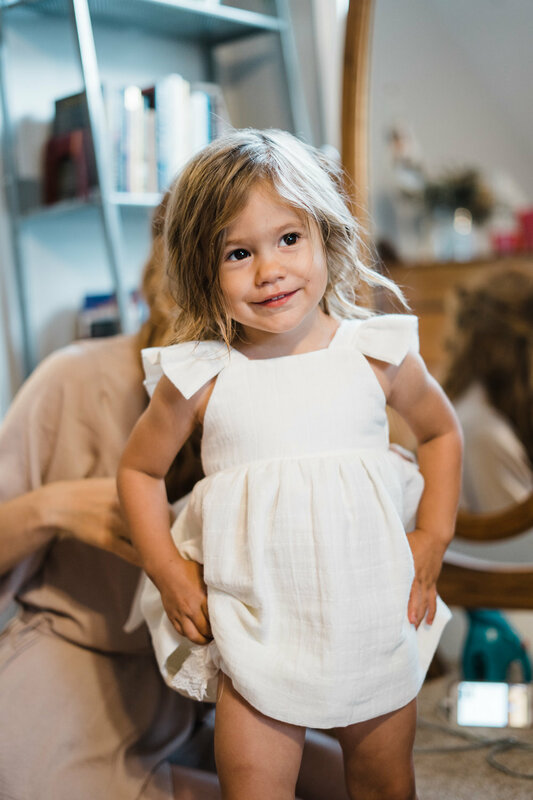 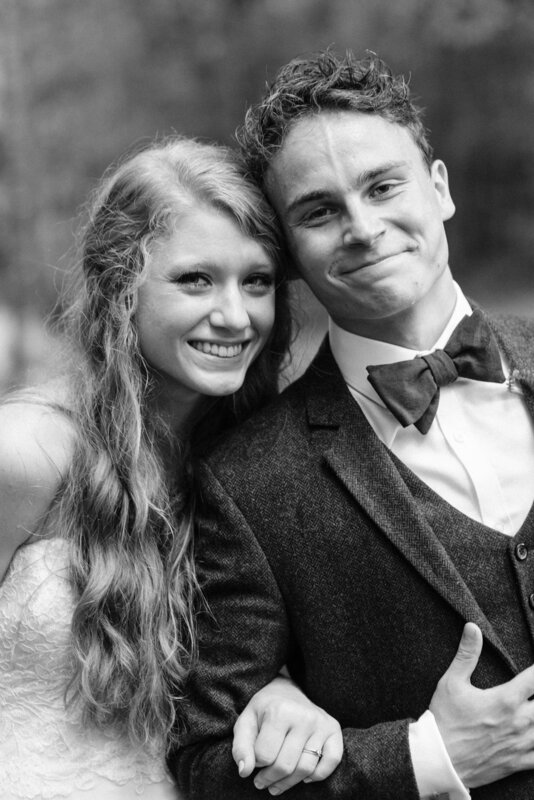 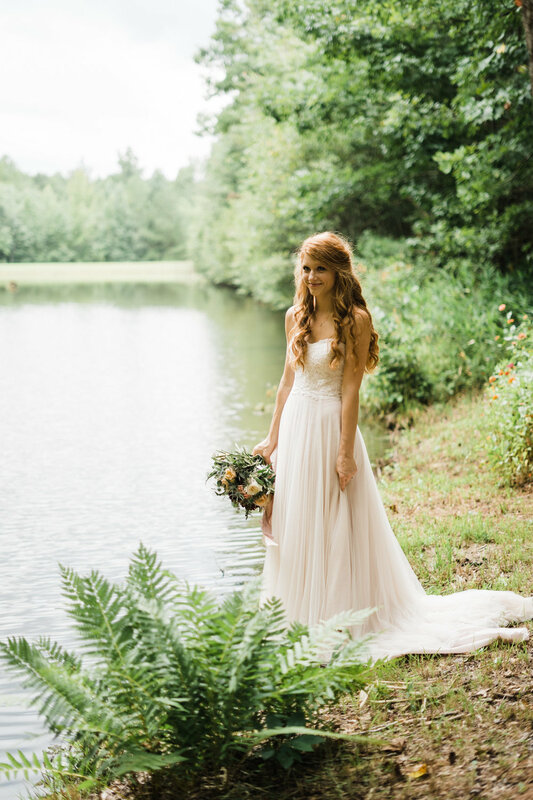 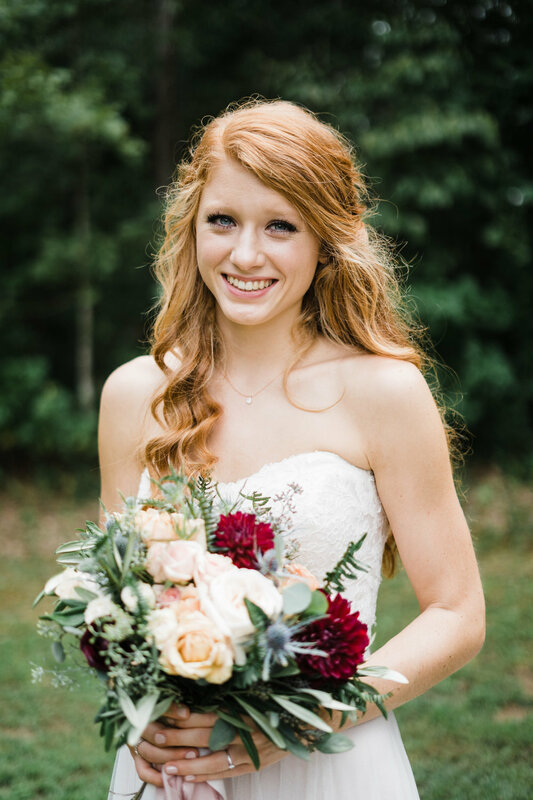 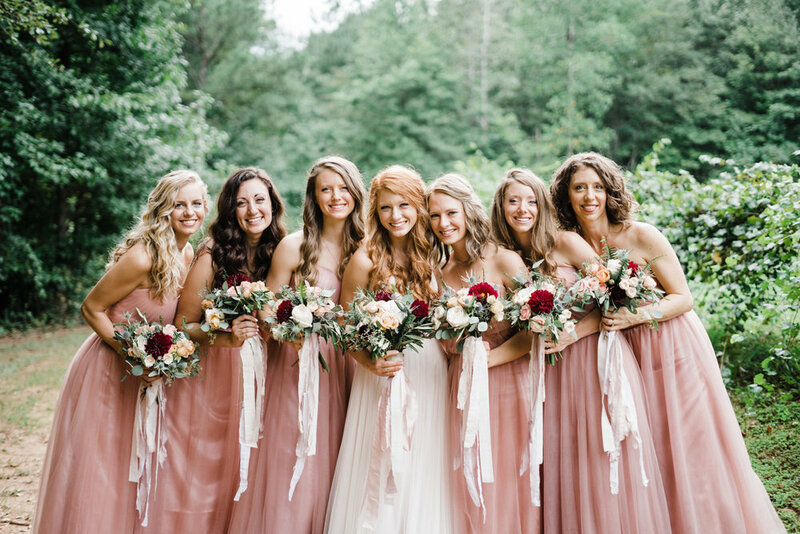 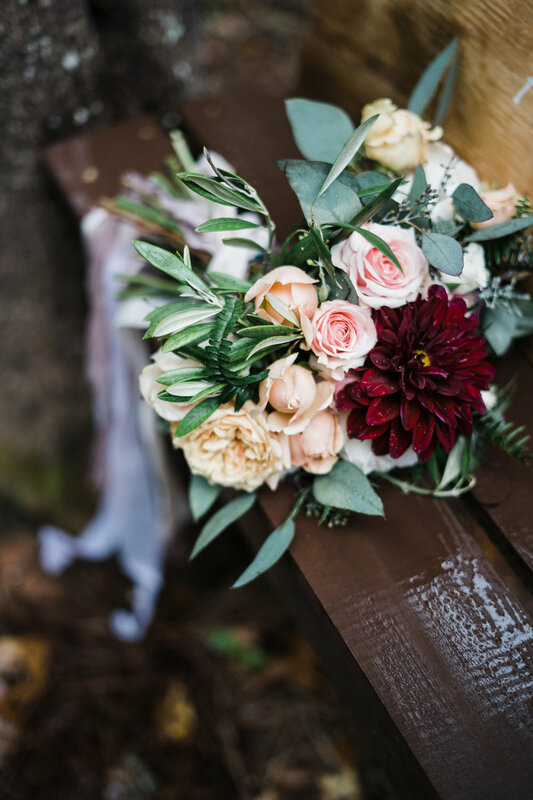 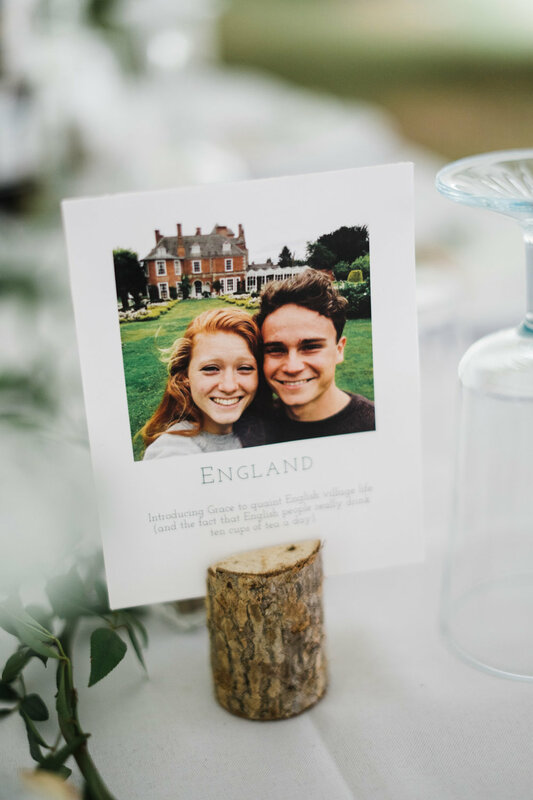 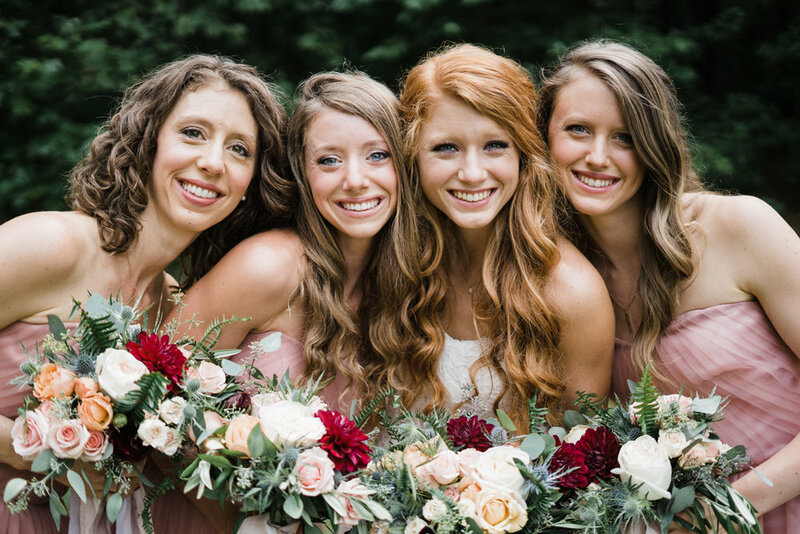 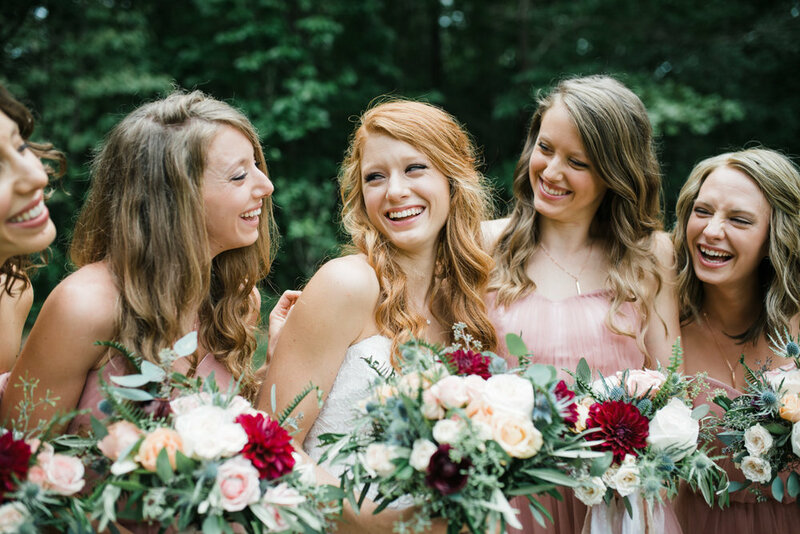 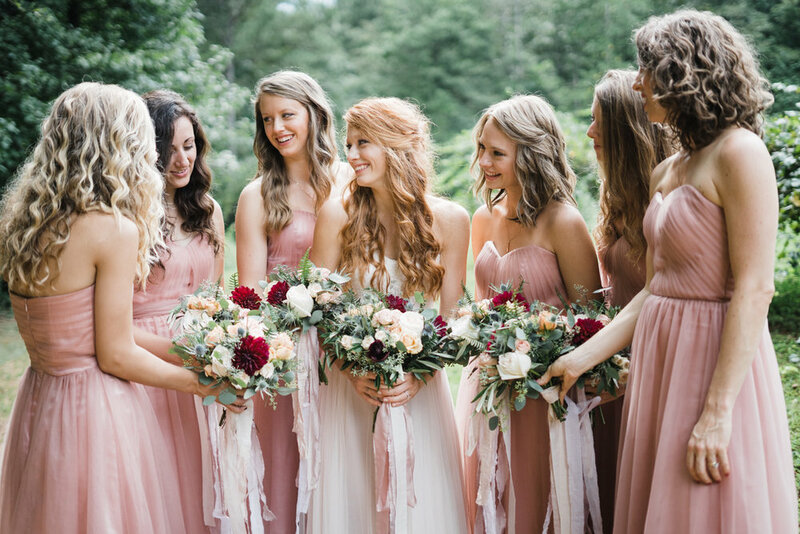 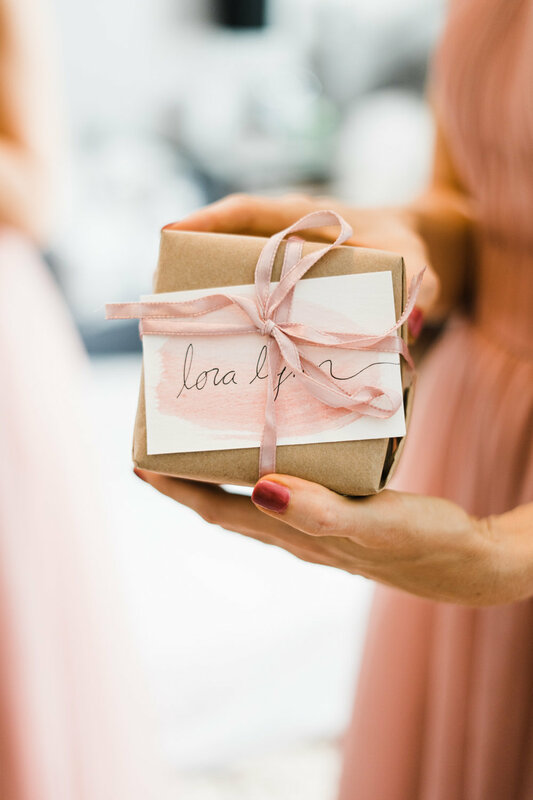 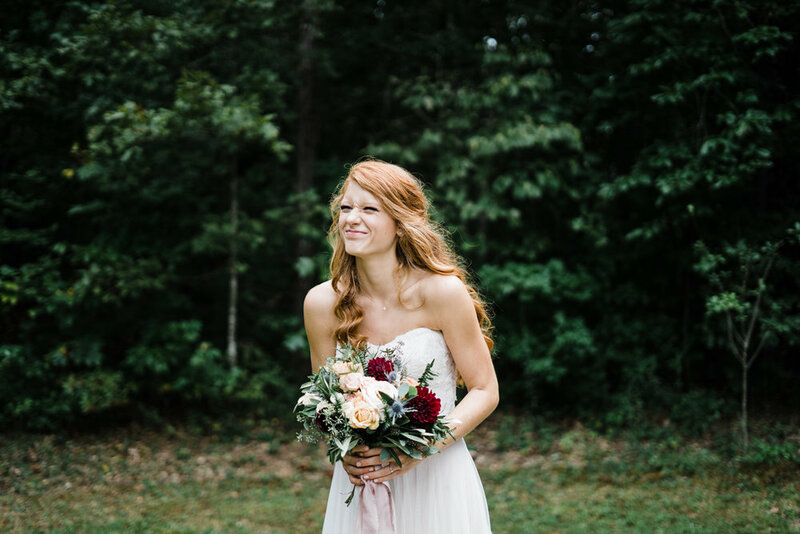 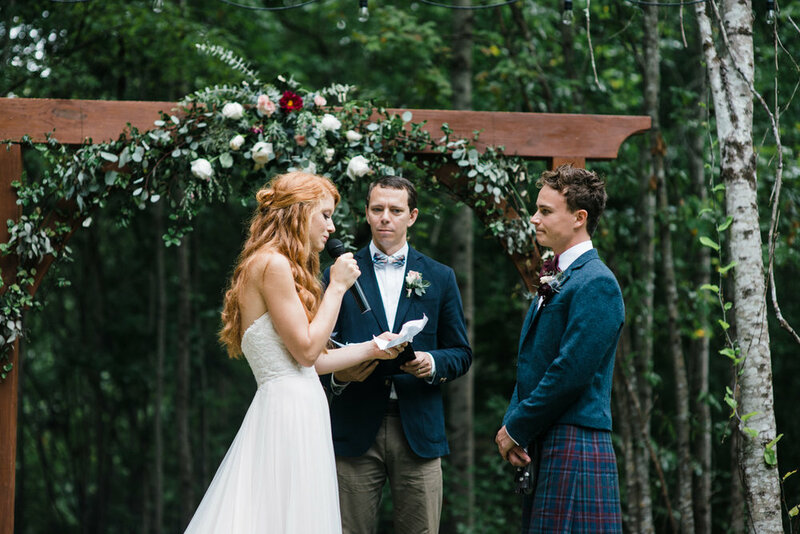 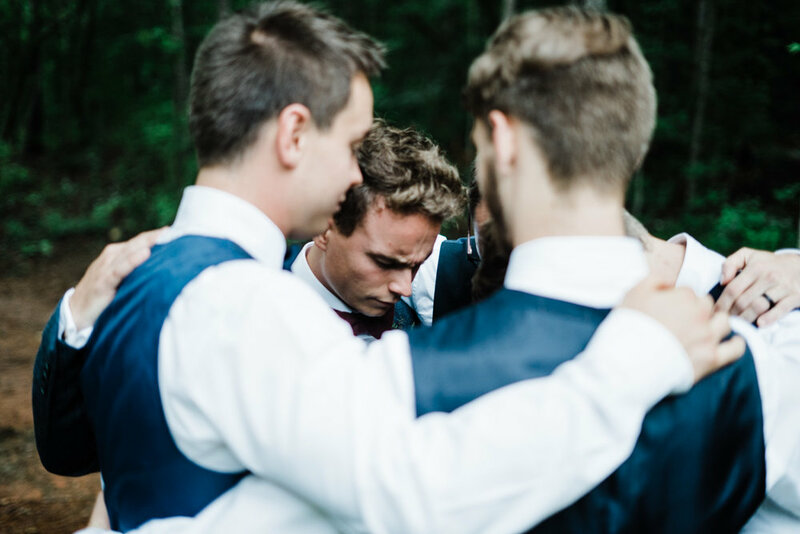 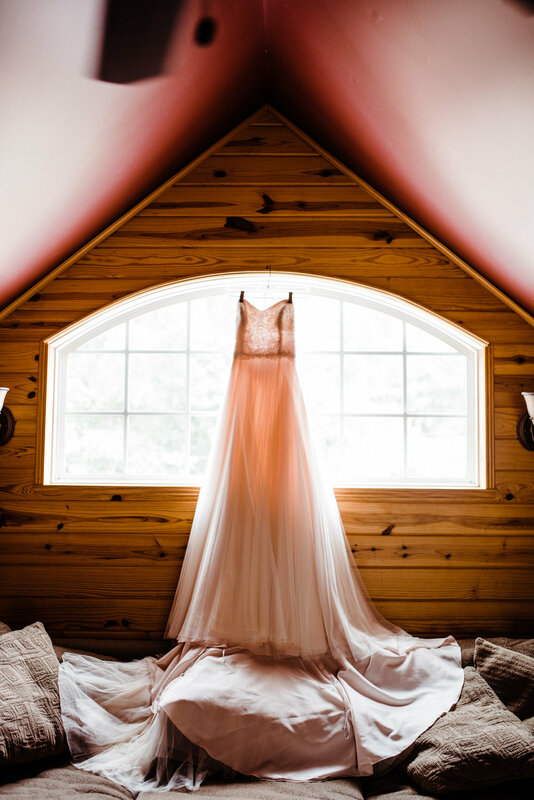 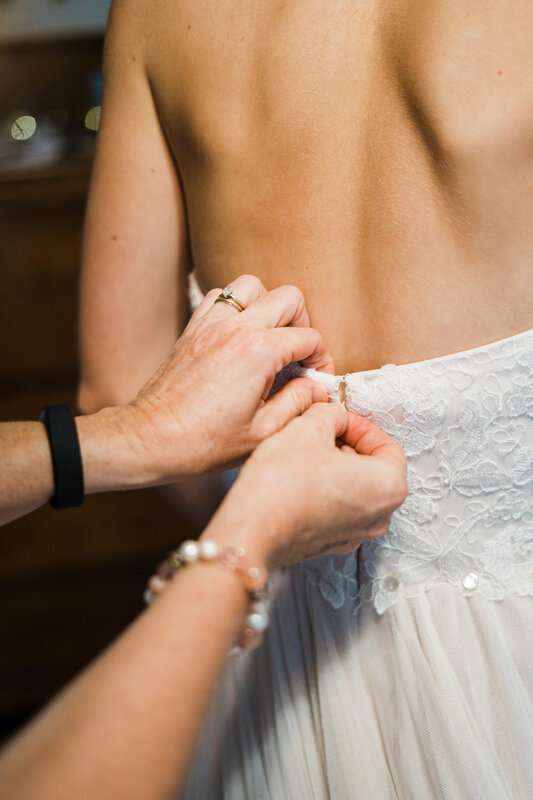 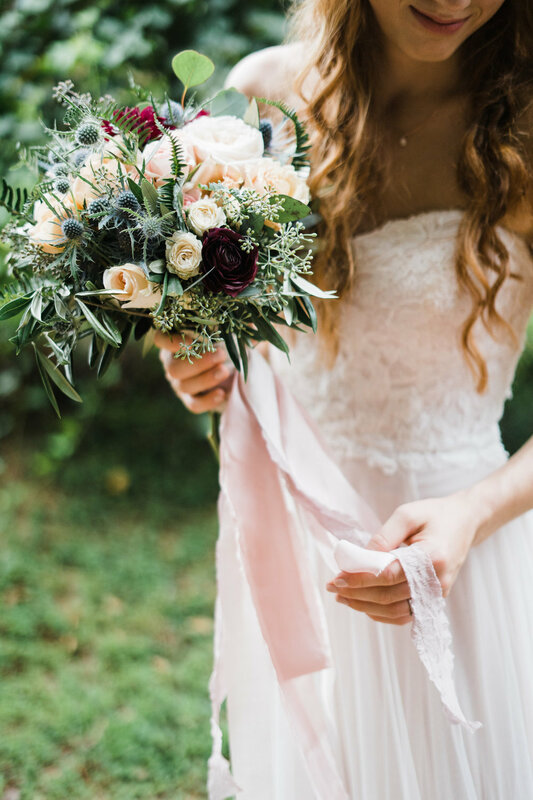 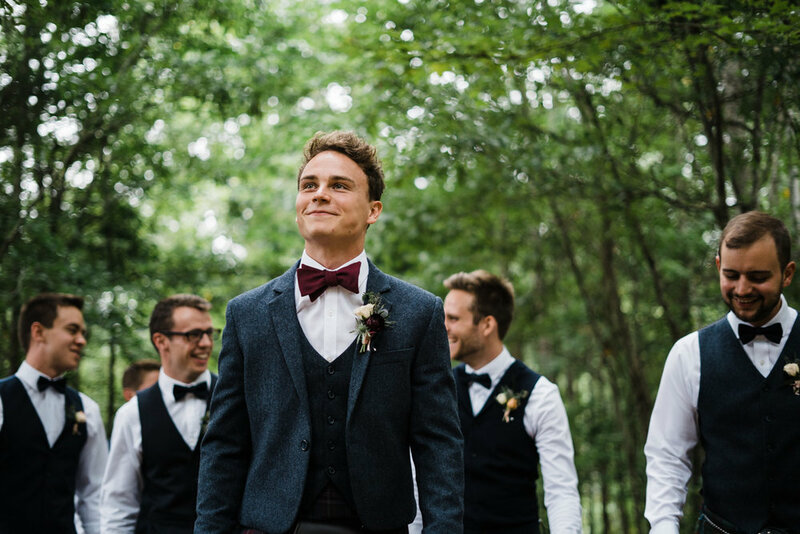 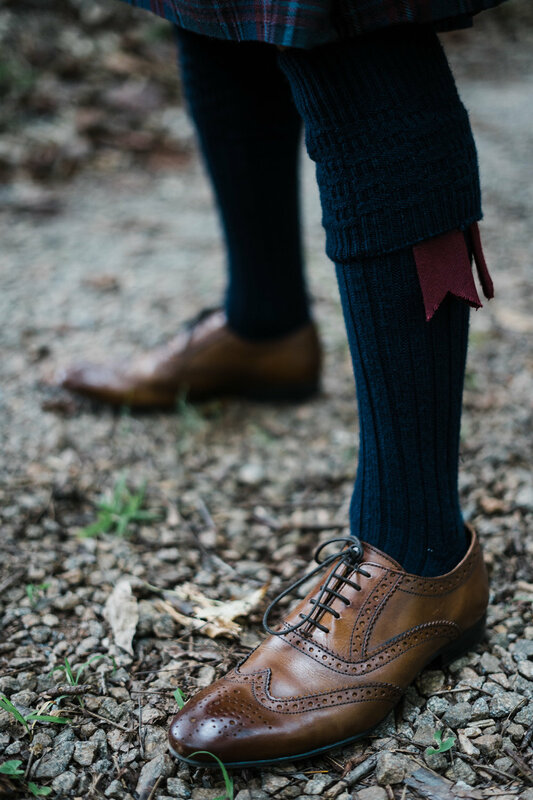 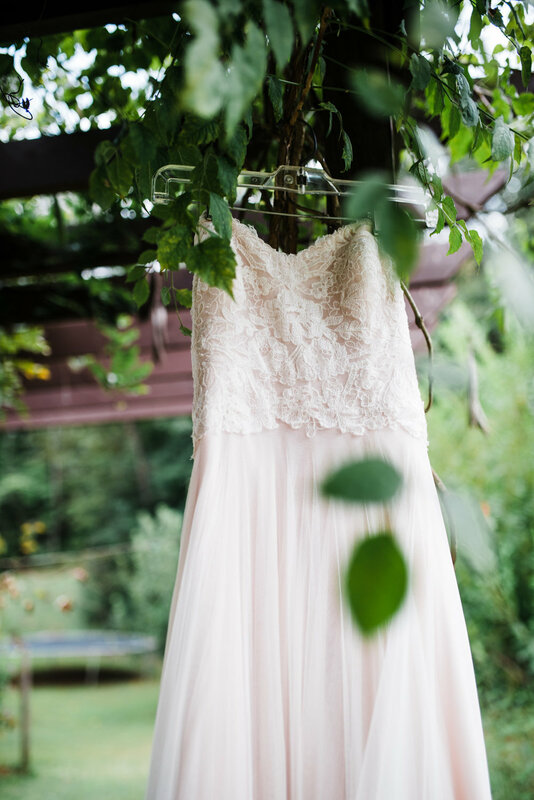 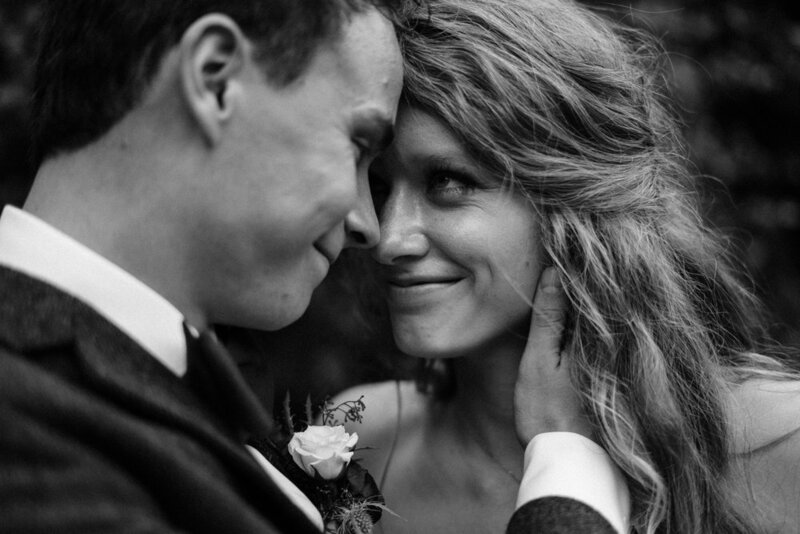 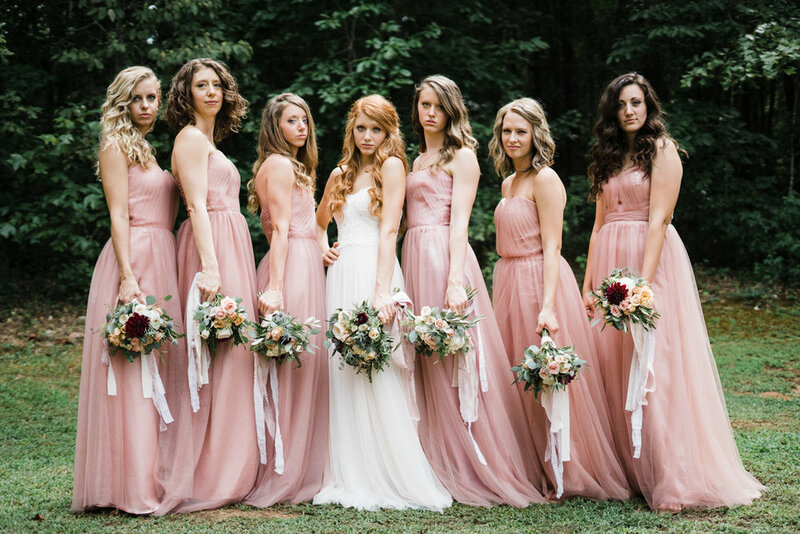 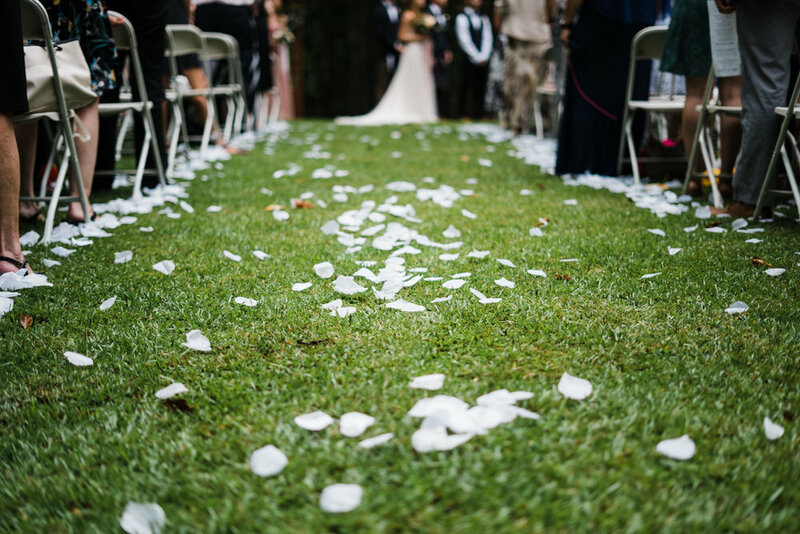 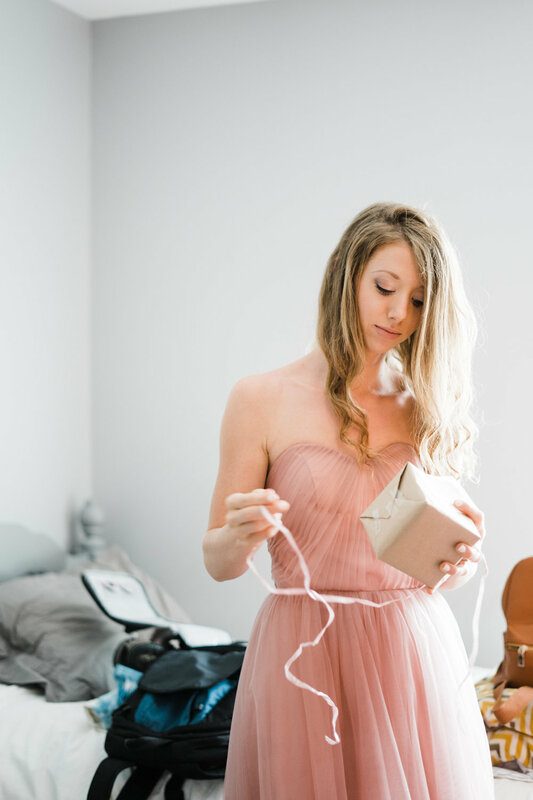 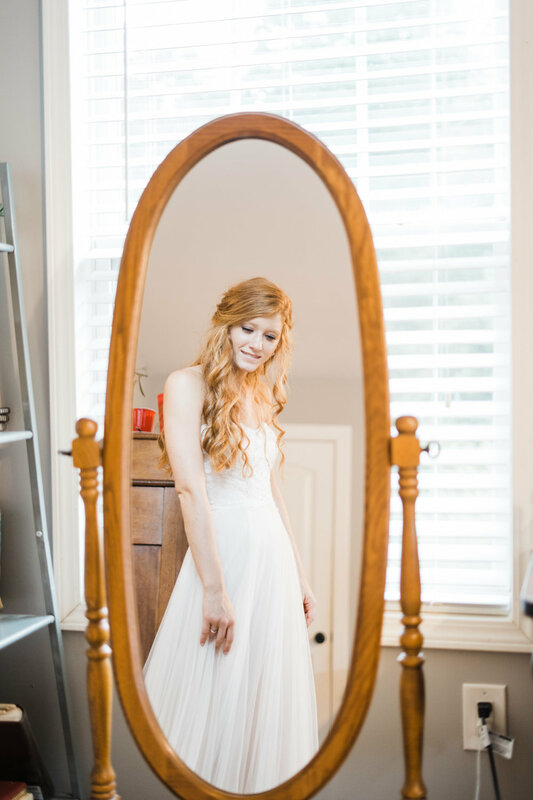 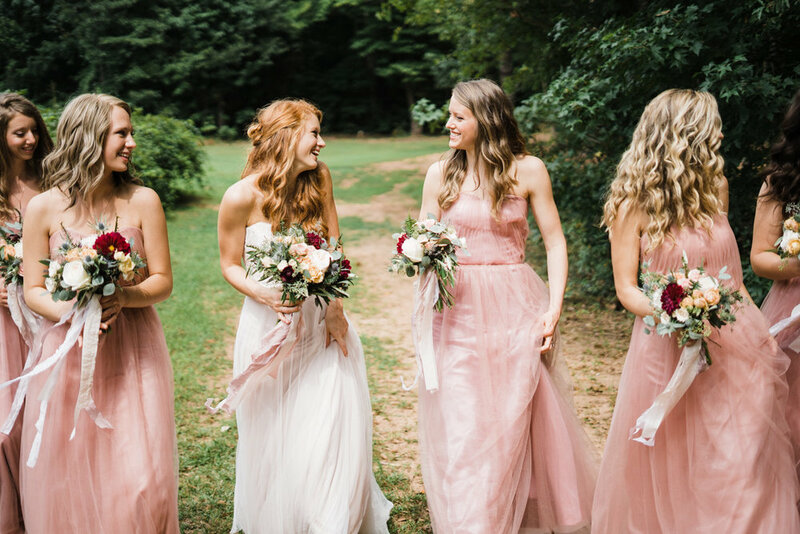 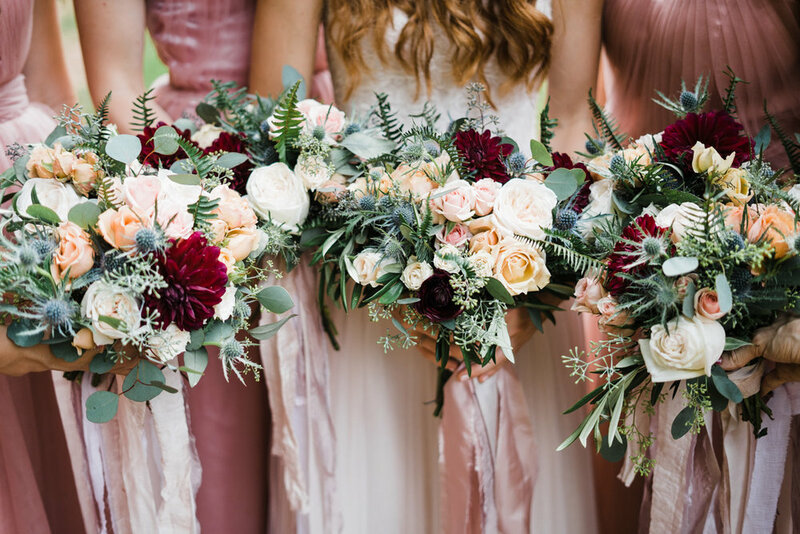 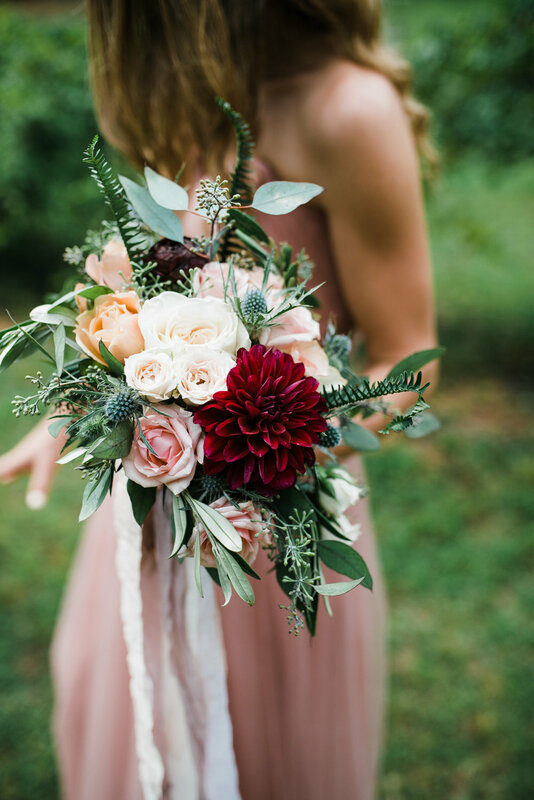 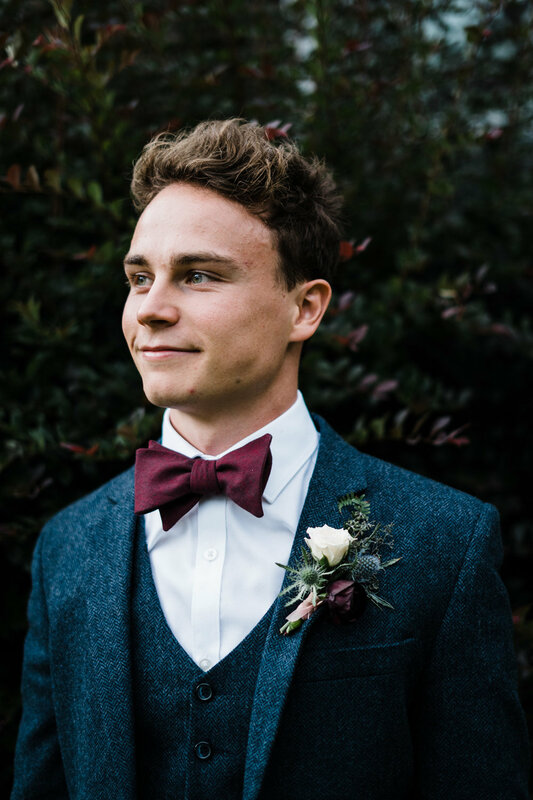 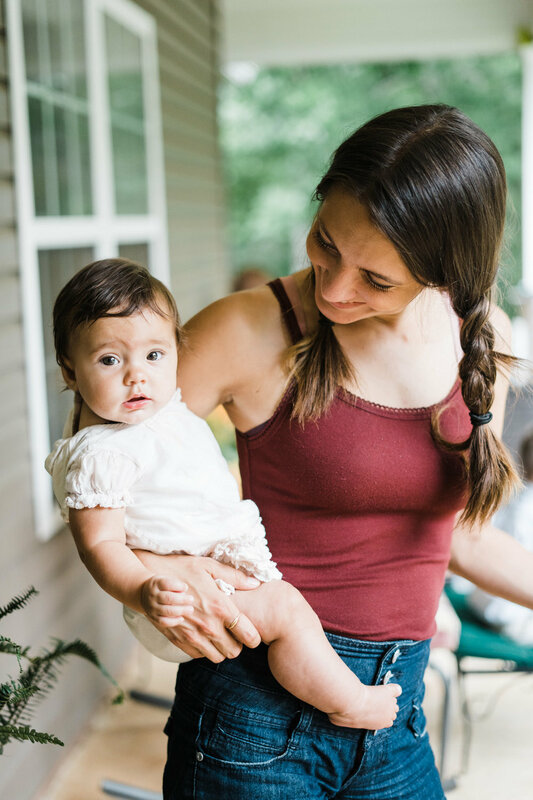 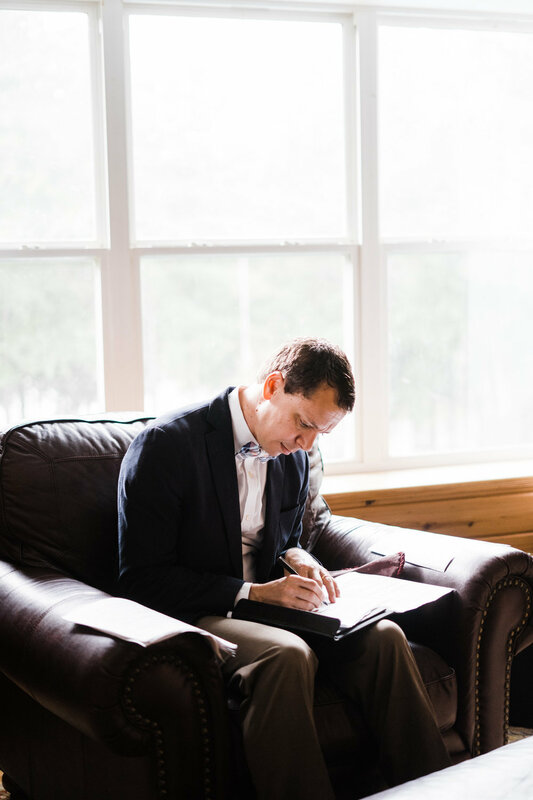 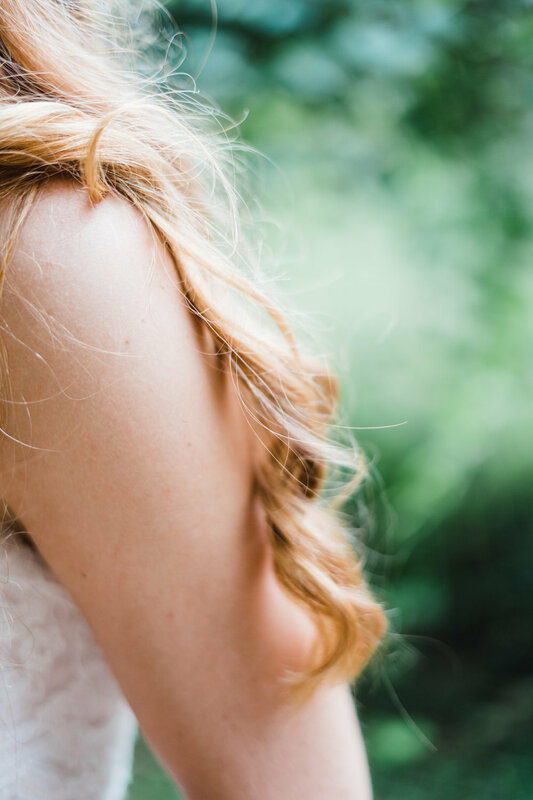 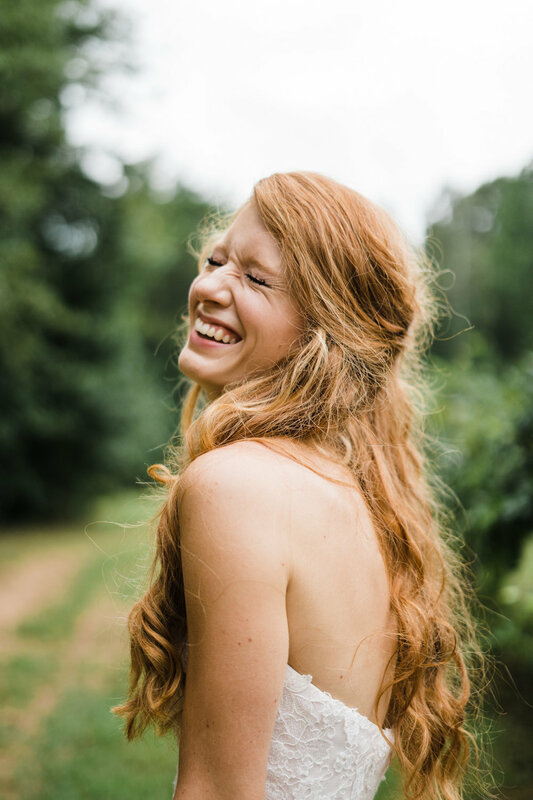 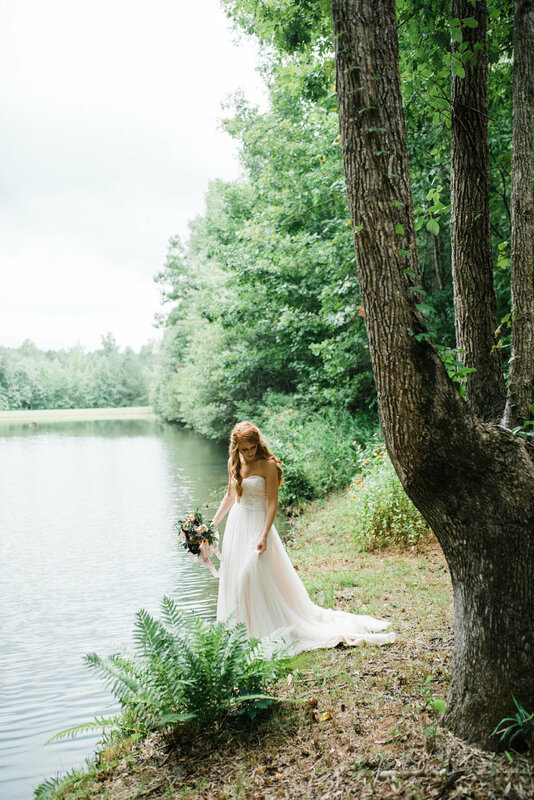 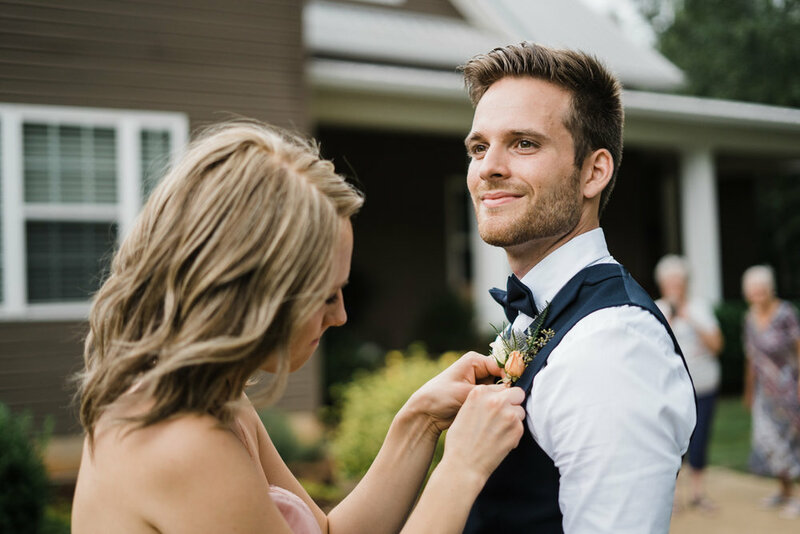 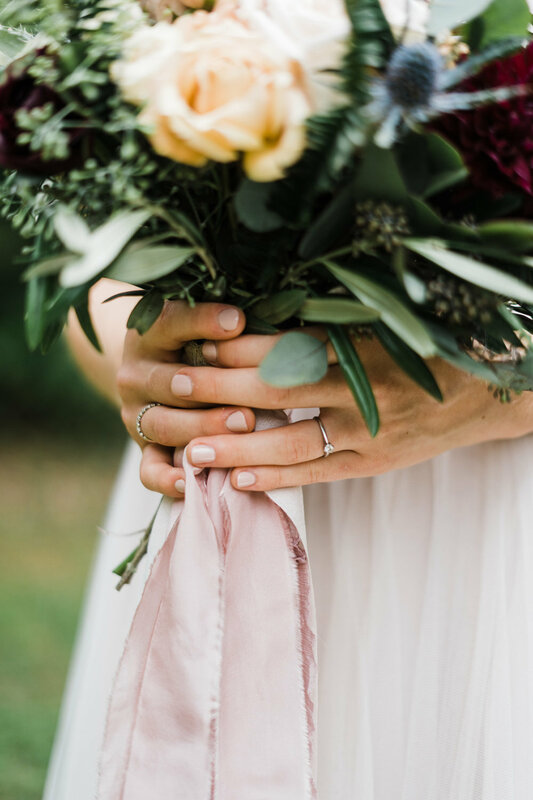 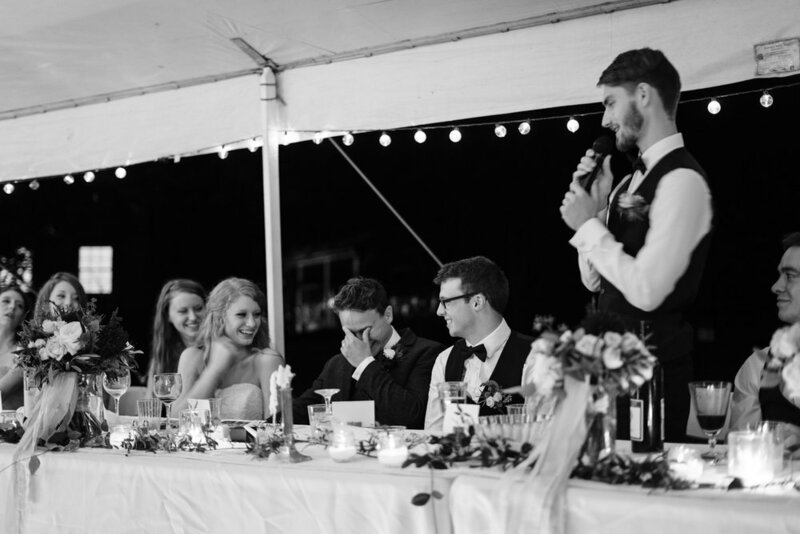 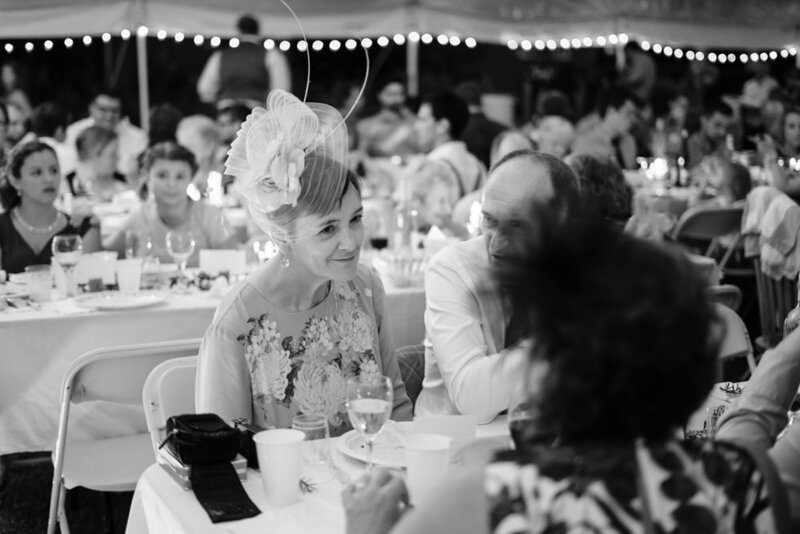 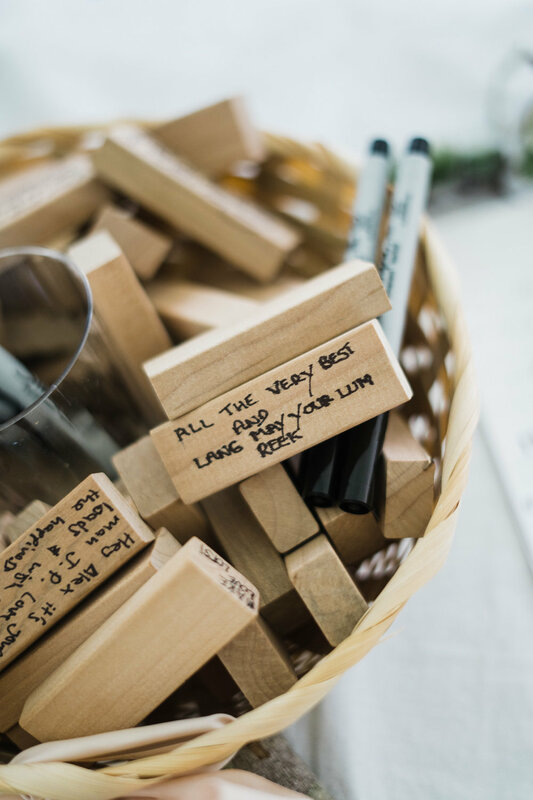 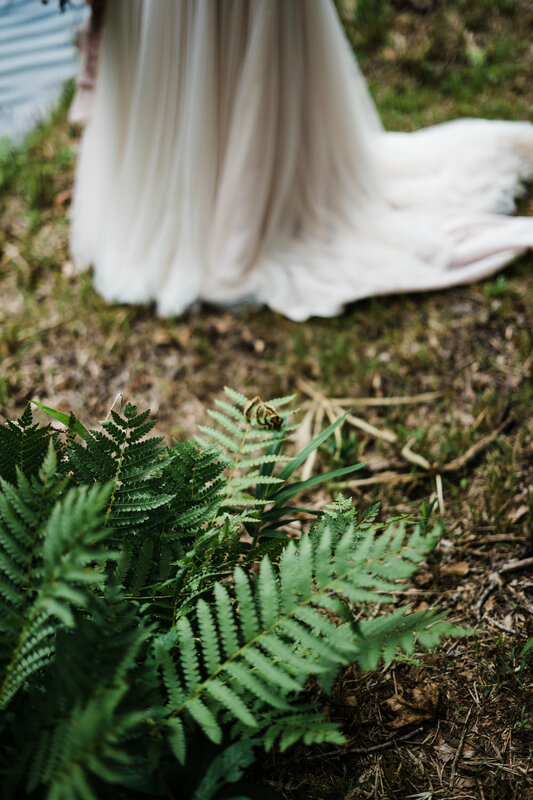 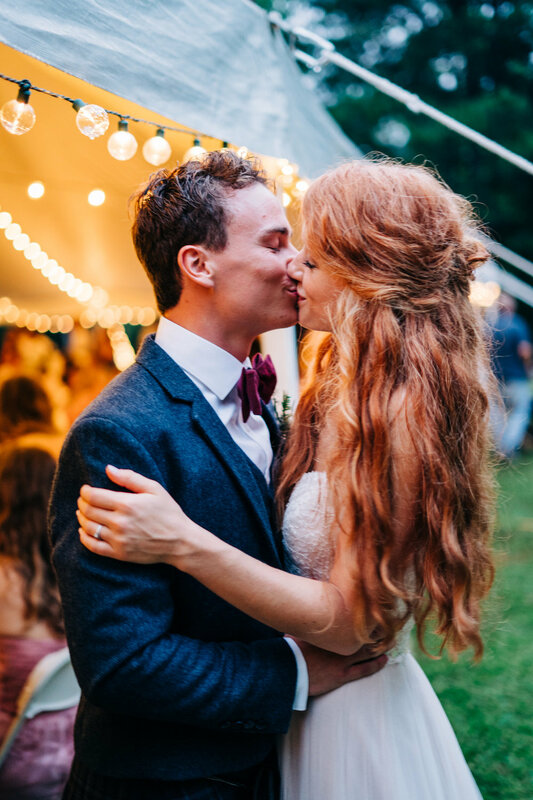 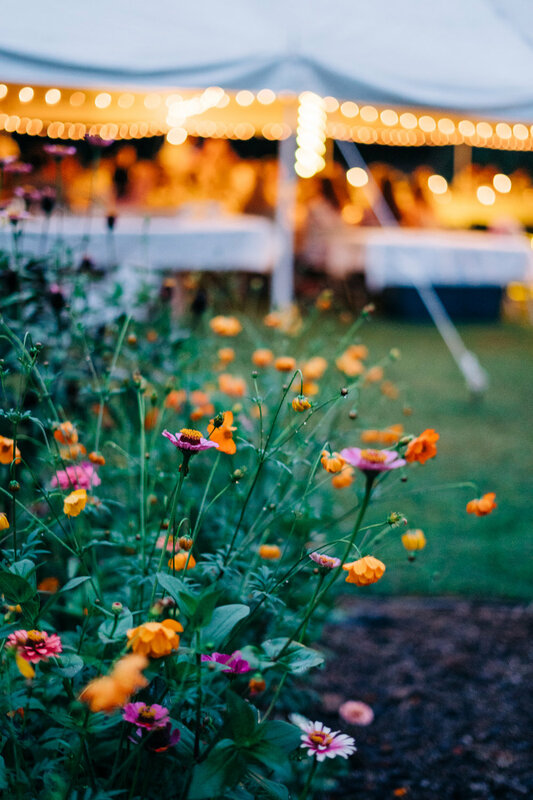 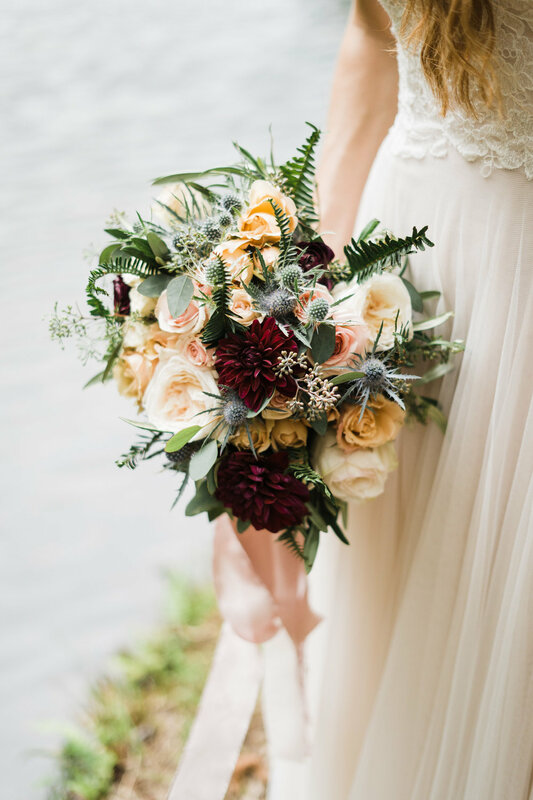 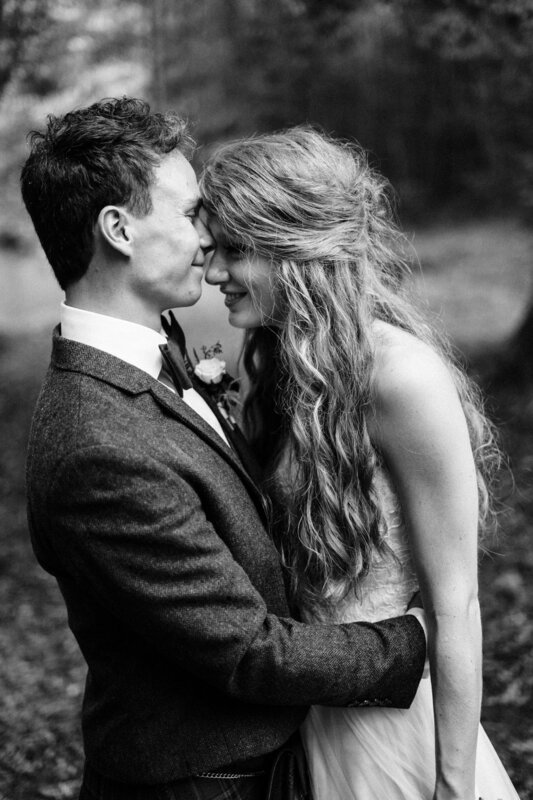 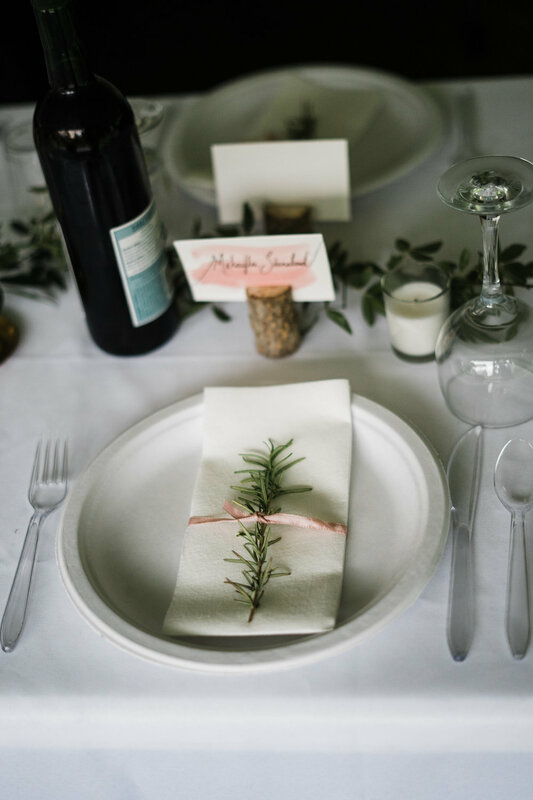 Nestled in the beautiful Alabama pine forests, the tiny town of Goodwater Alabama has hosted not one but two weddings joining an Alabama girl to a British boy. 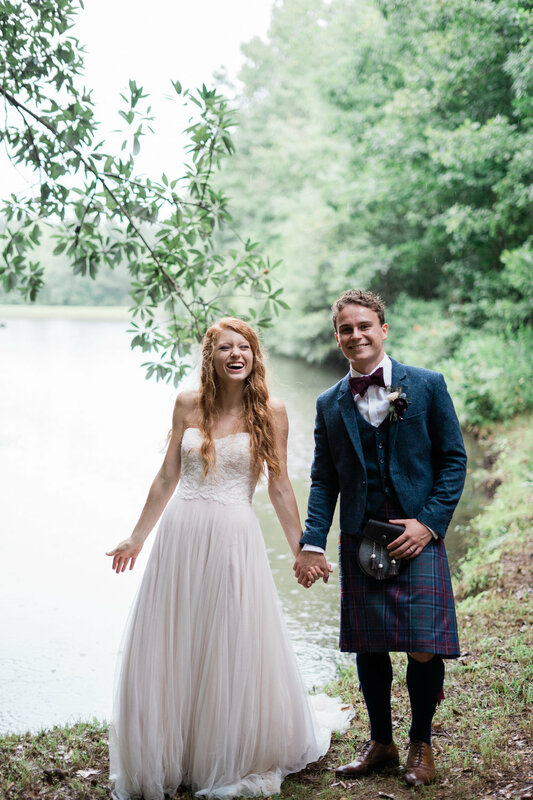 Their wedding hash tag was #gritsandbrits18, which is a hilarious nod to Grace's southern American heritage, and Alex's homeland. 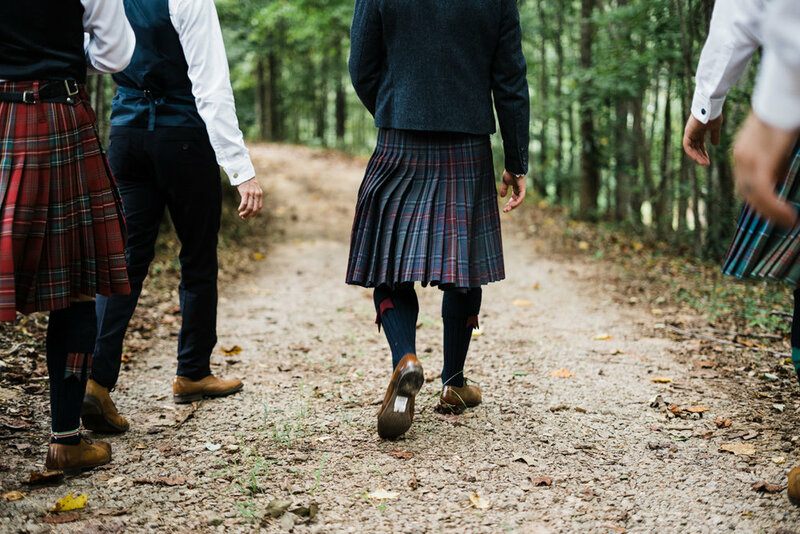 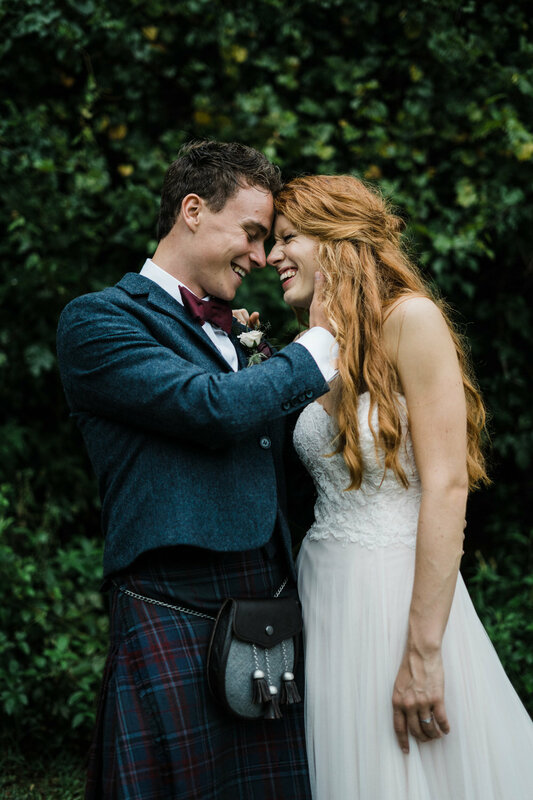 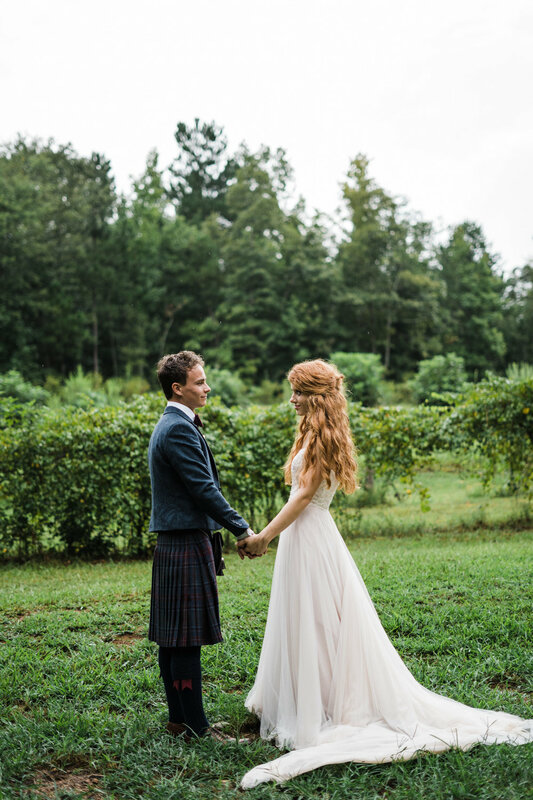 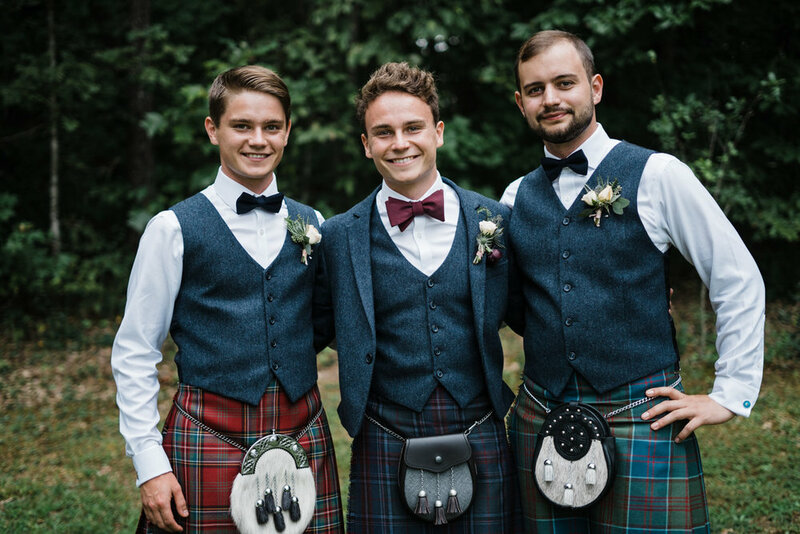 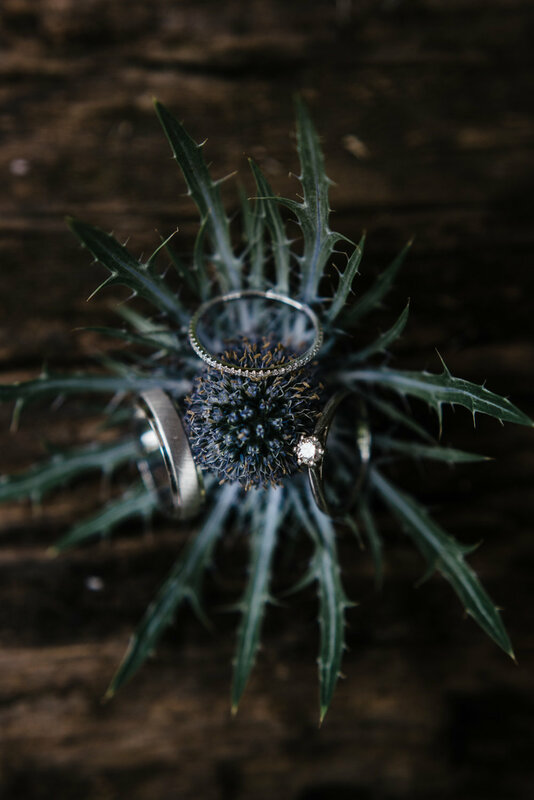 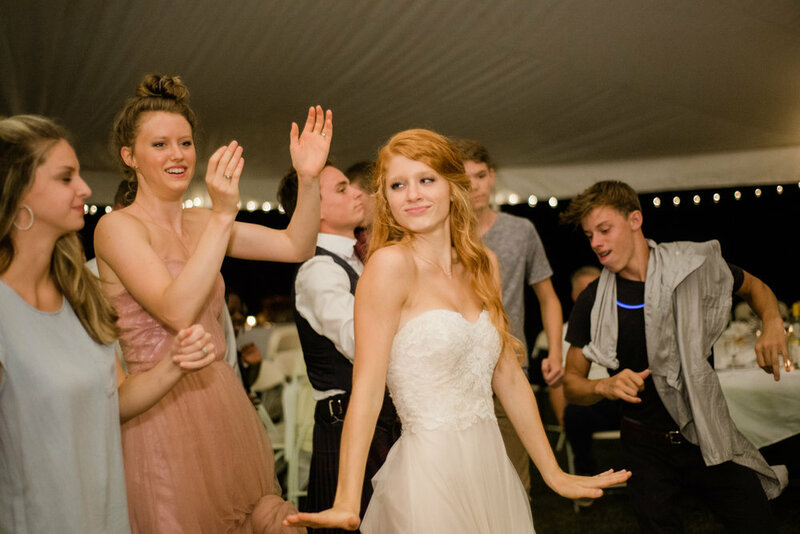 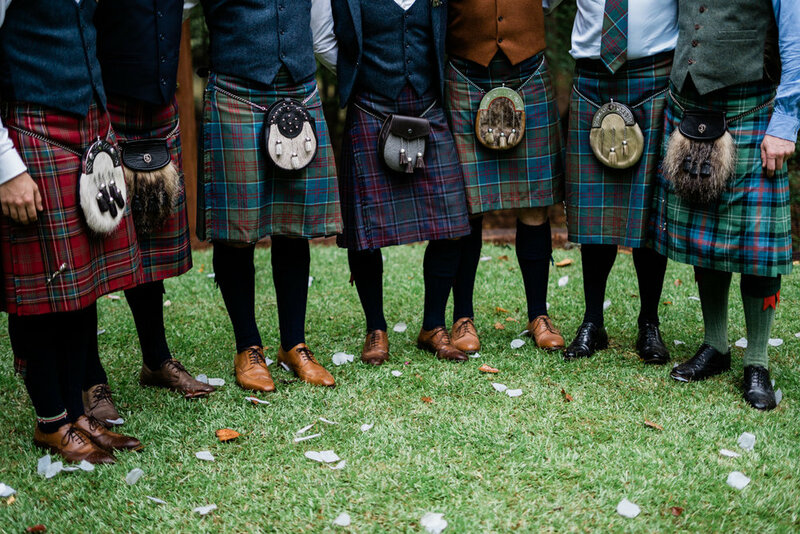 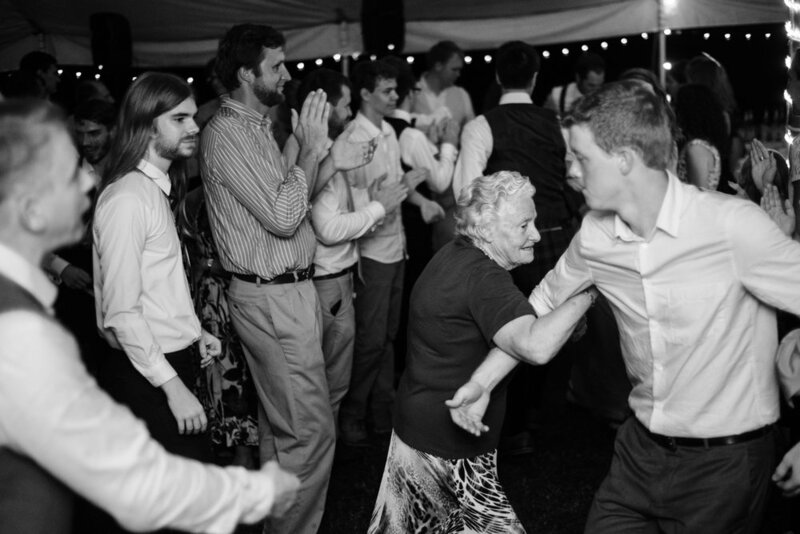 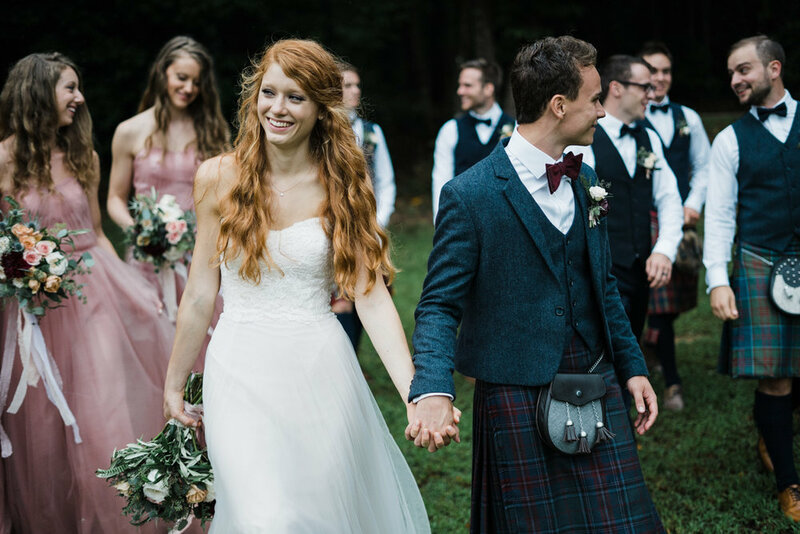 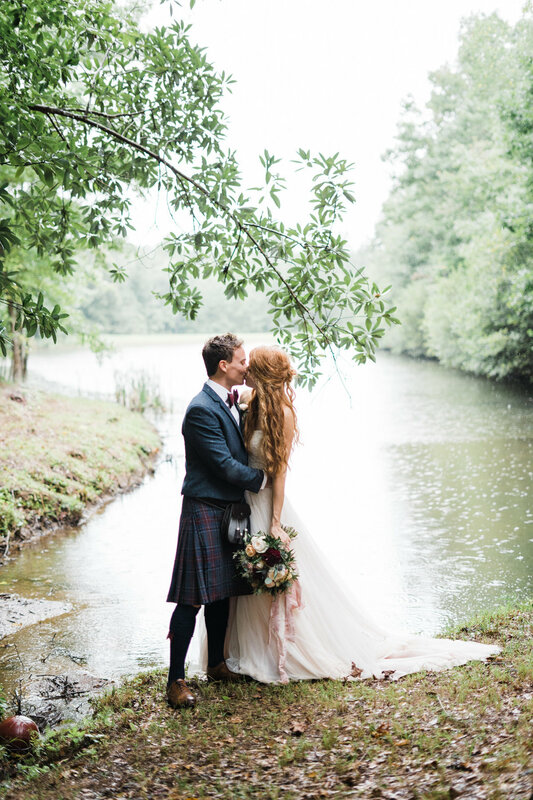 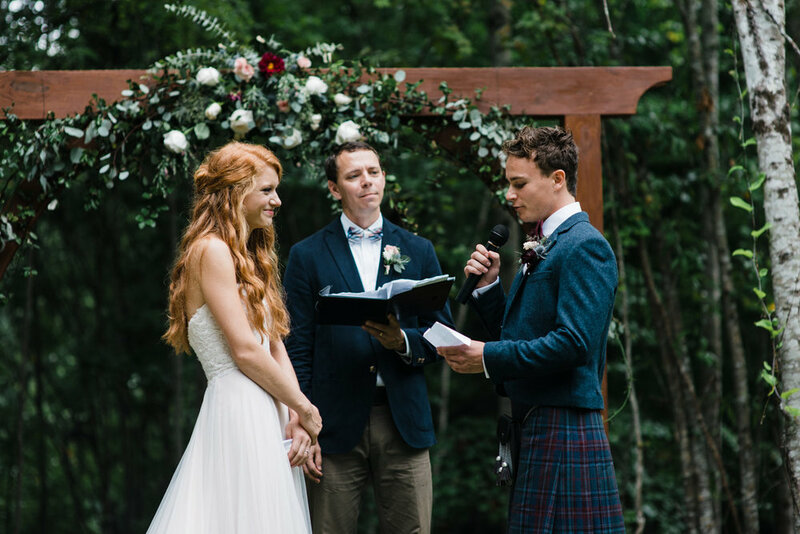 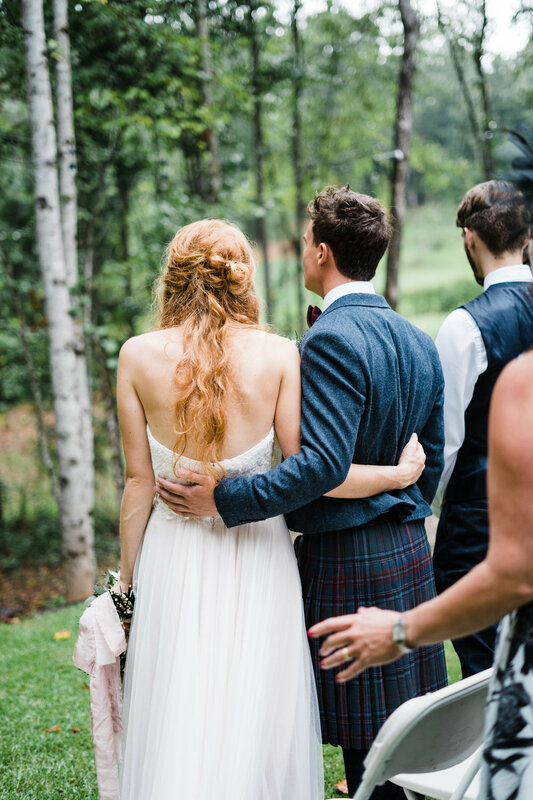 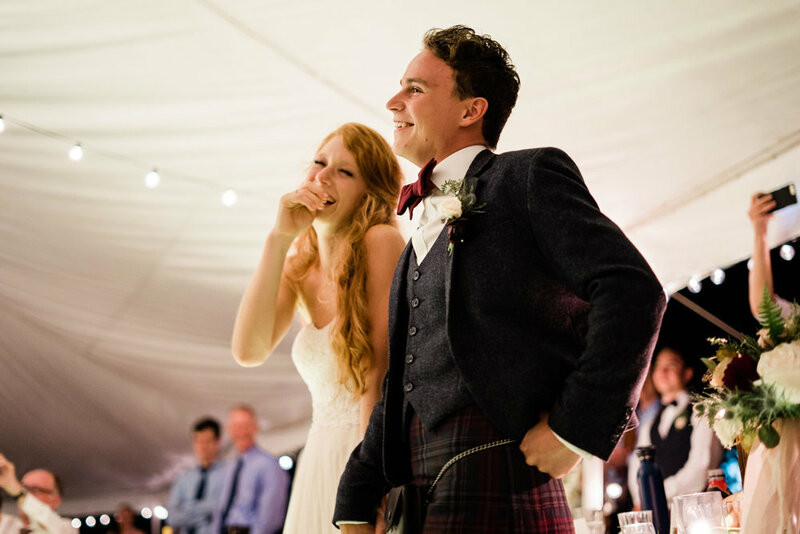 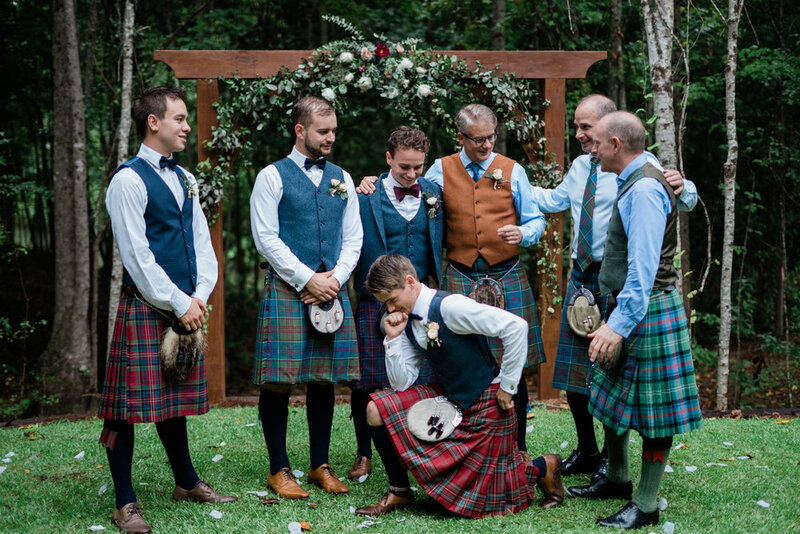 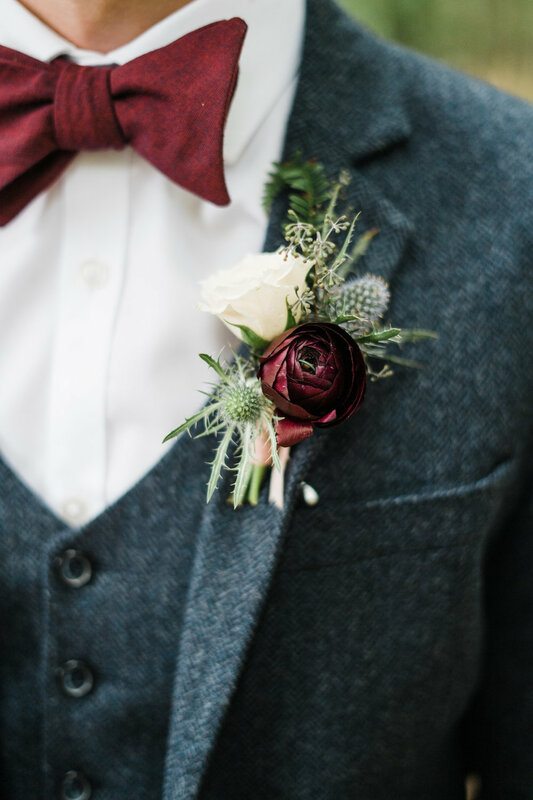 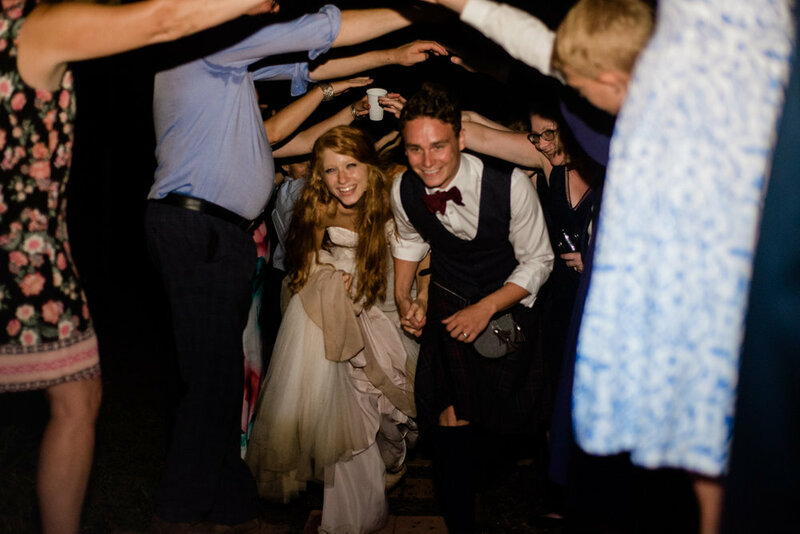 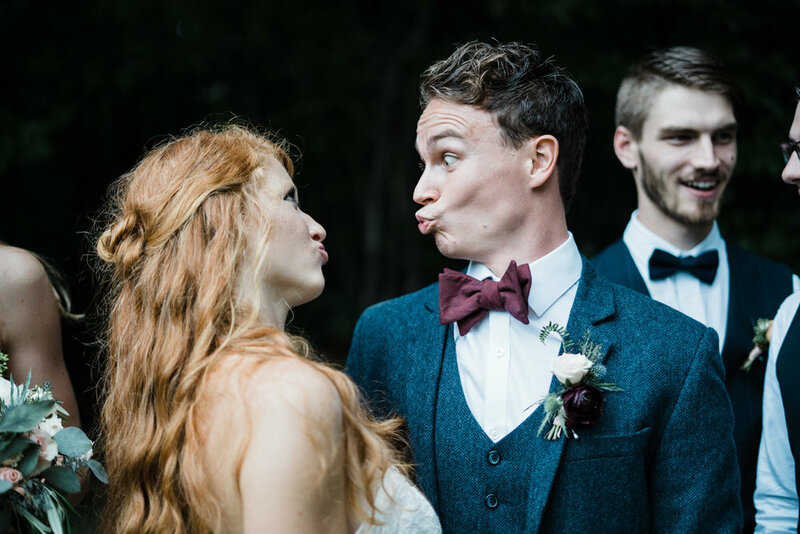 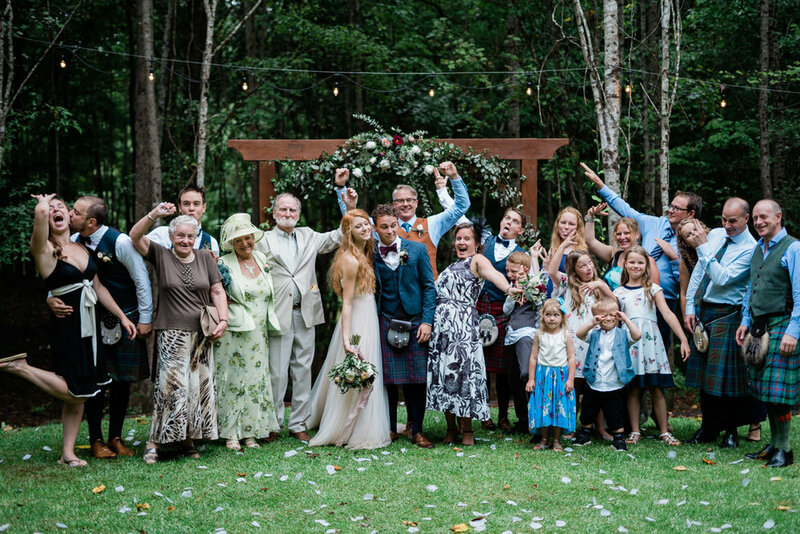 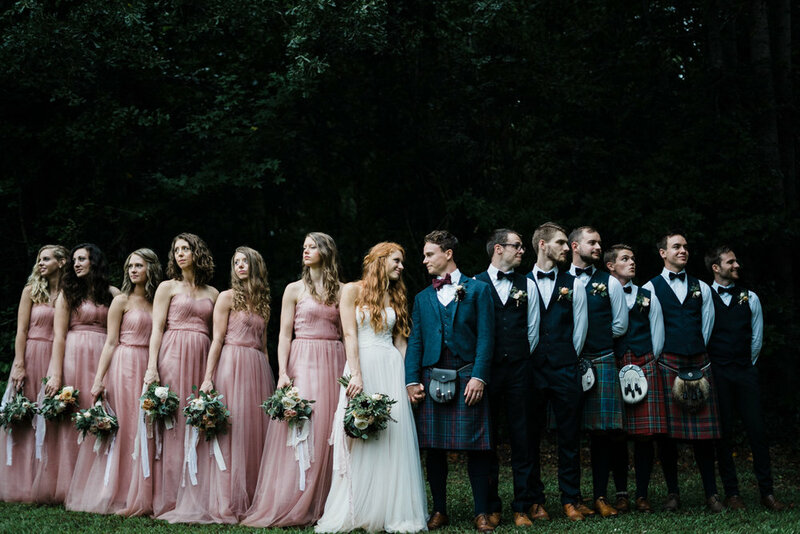 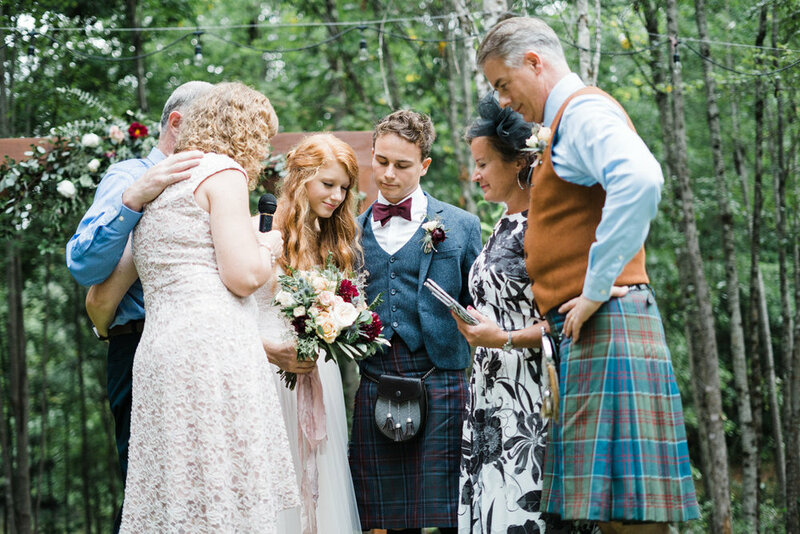 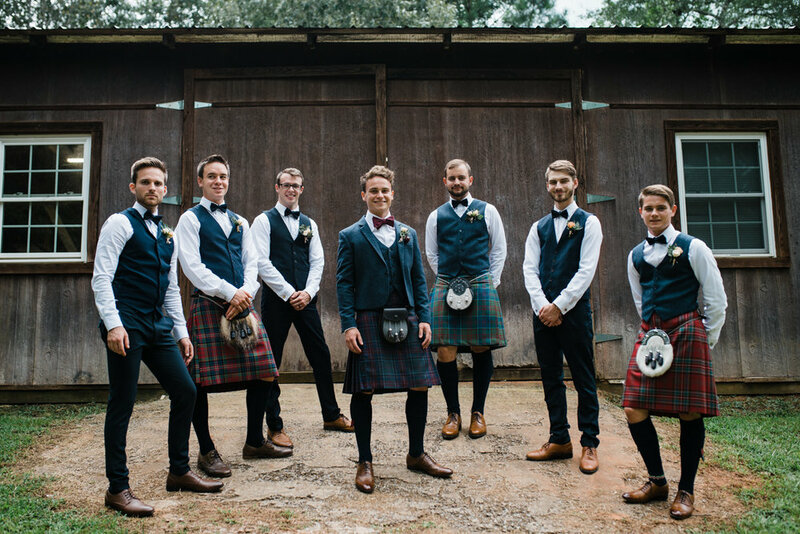 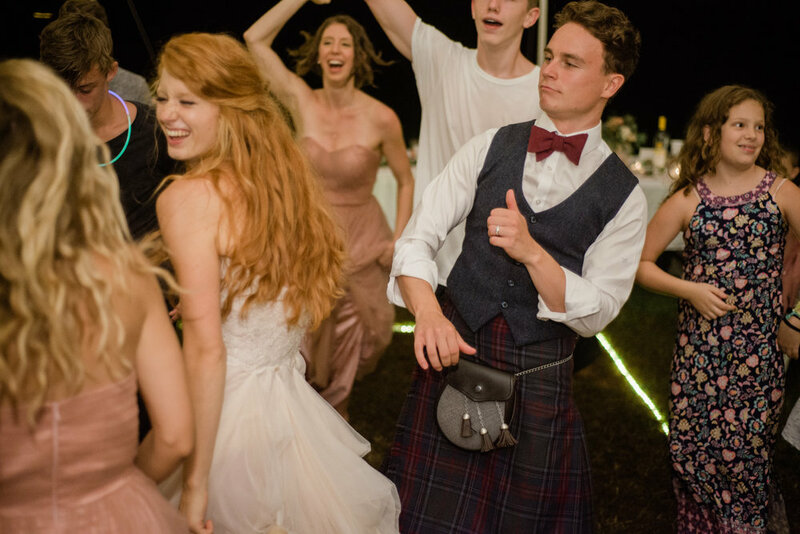 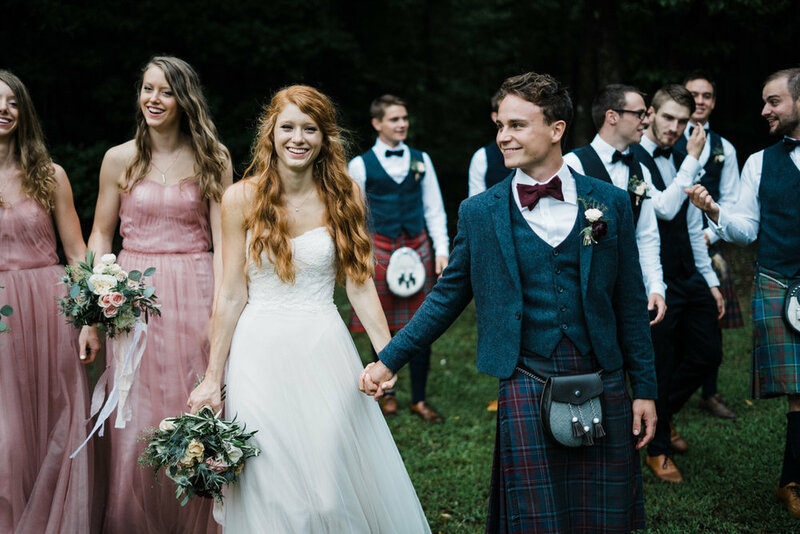 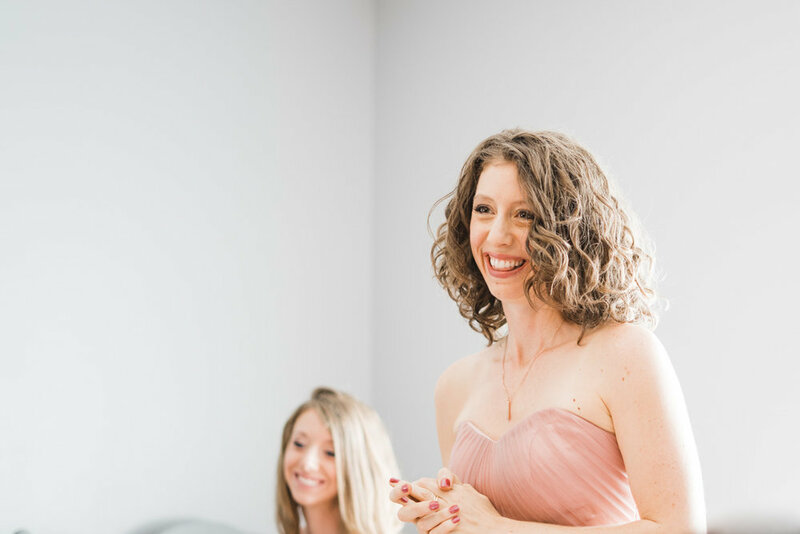 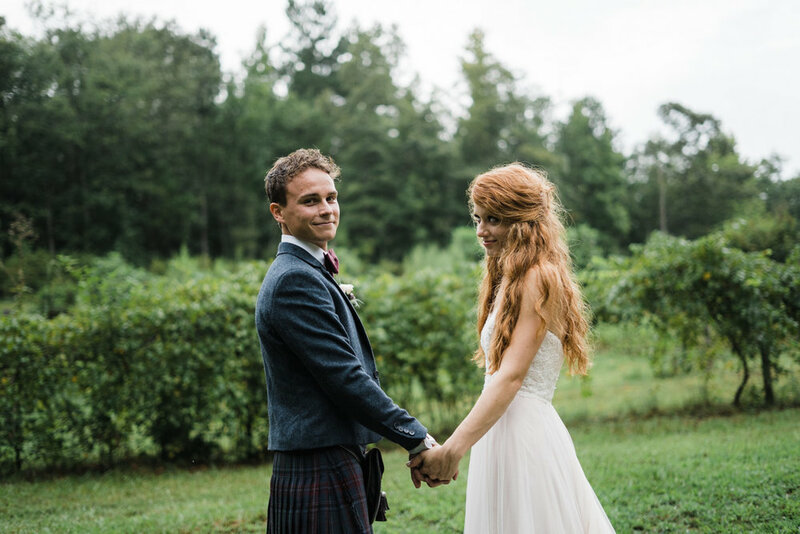 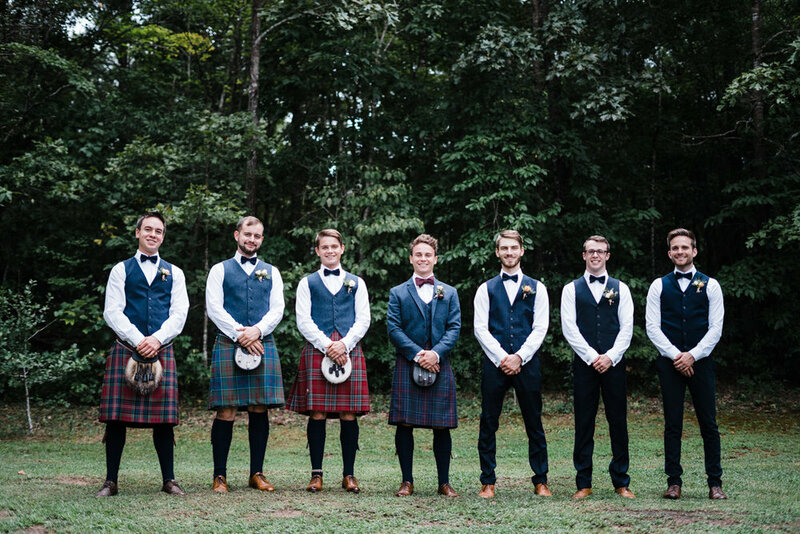 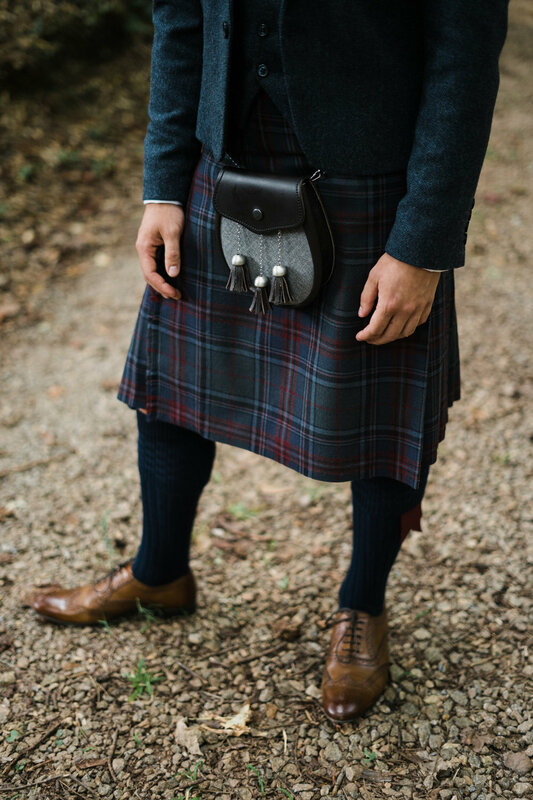 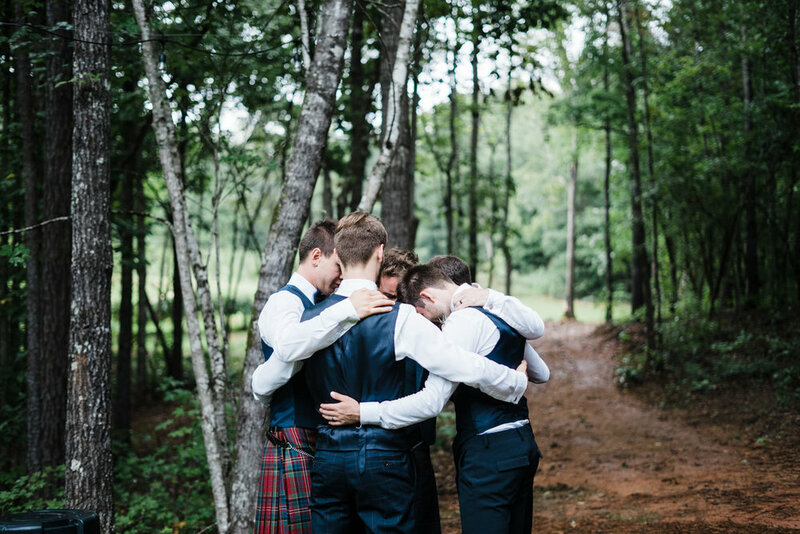 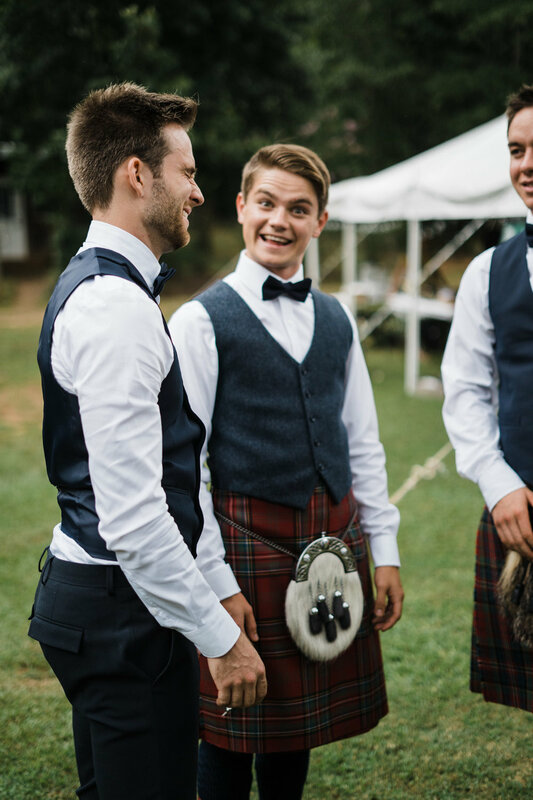 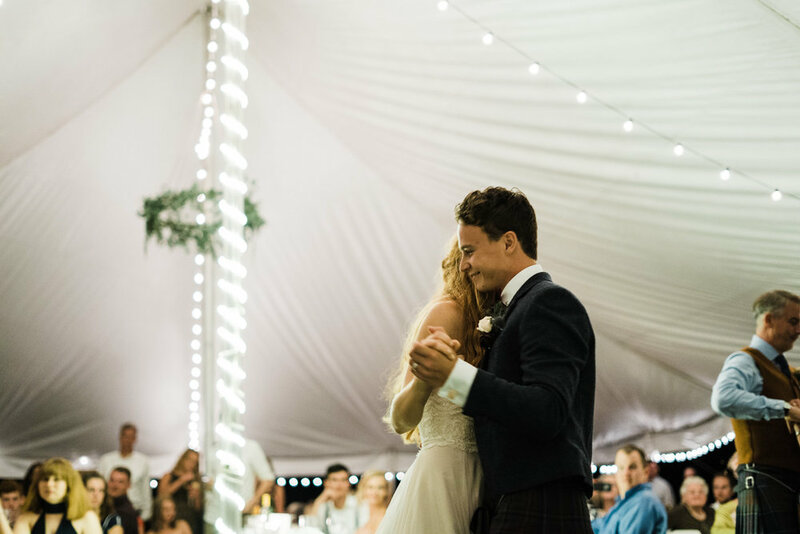 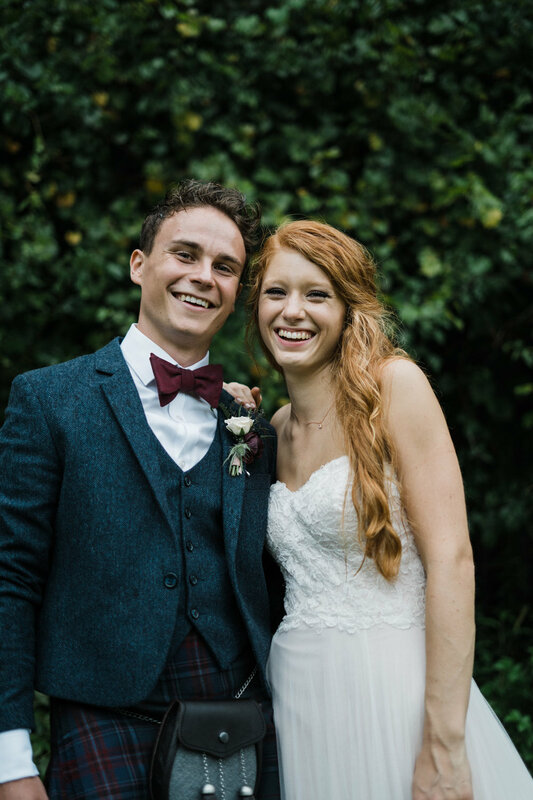 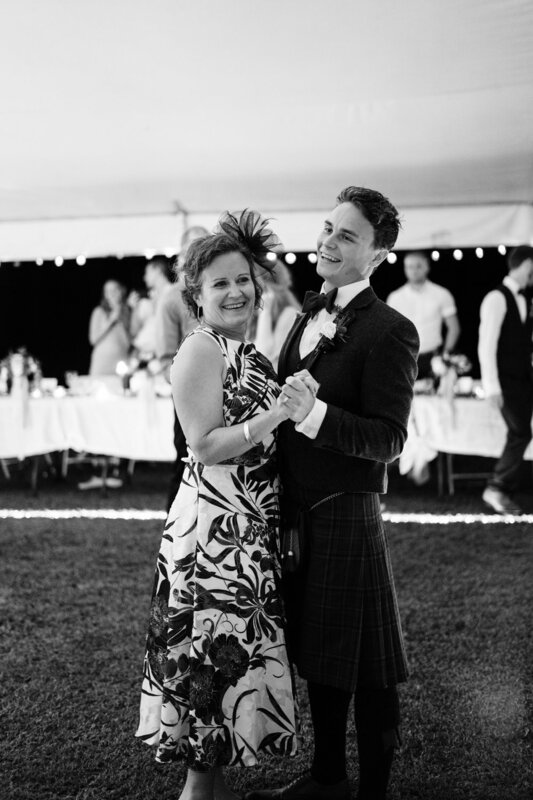 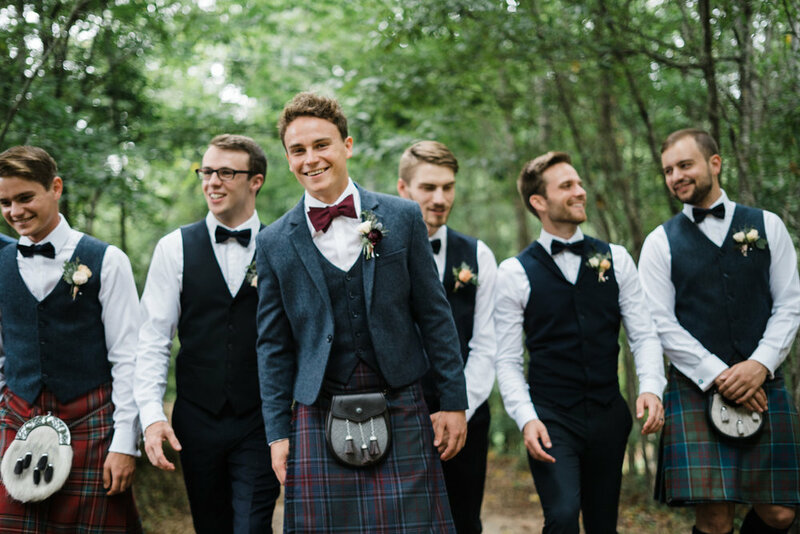 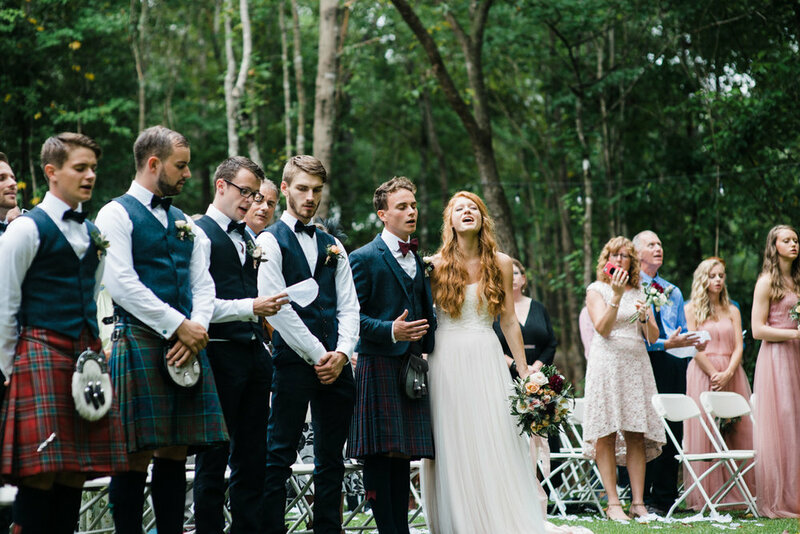 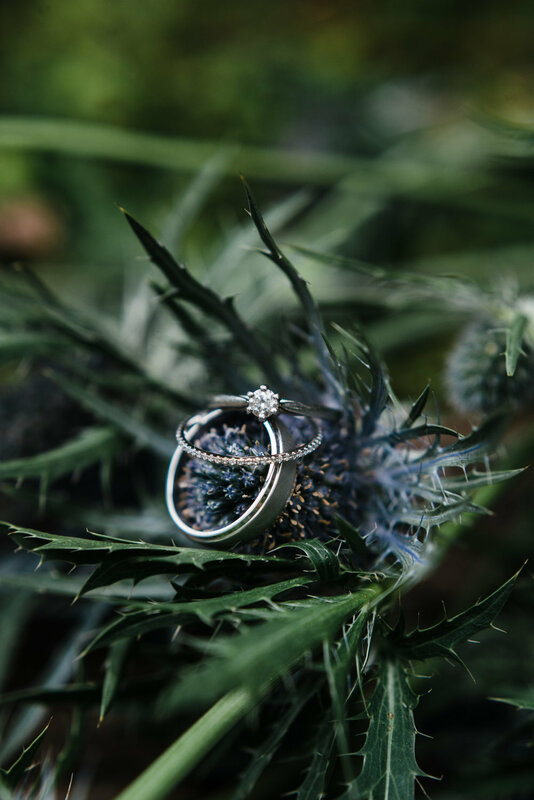 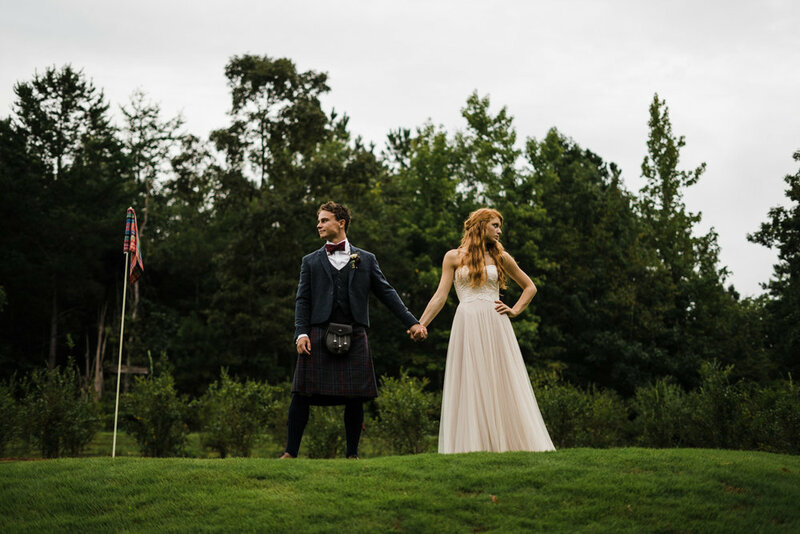 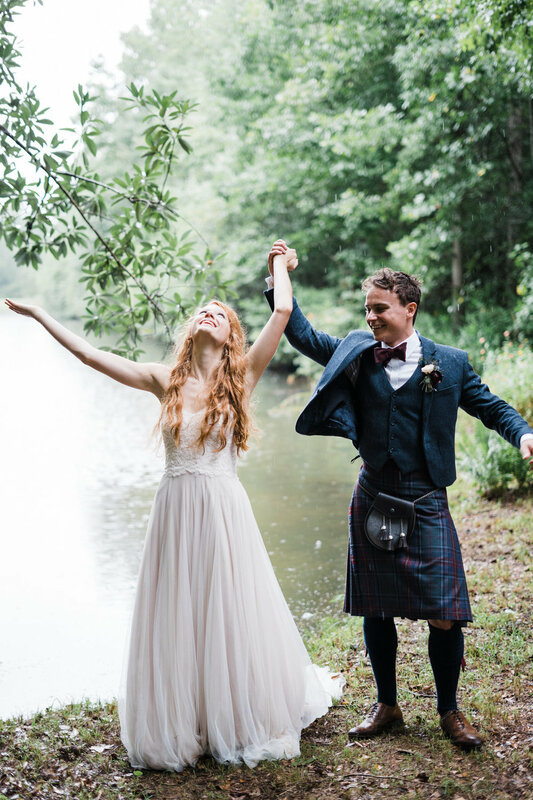 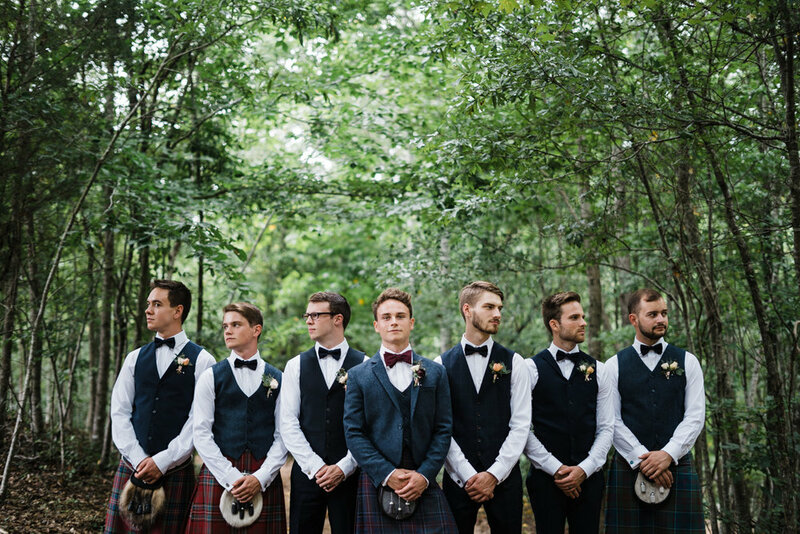 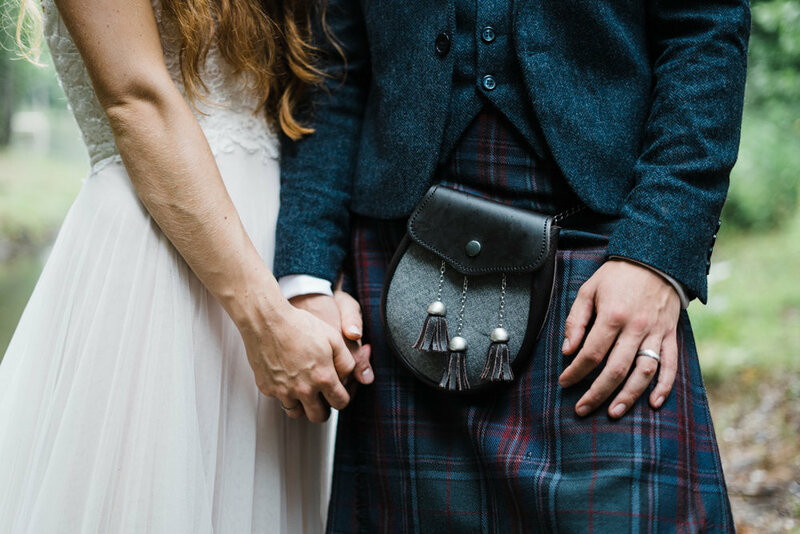 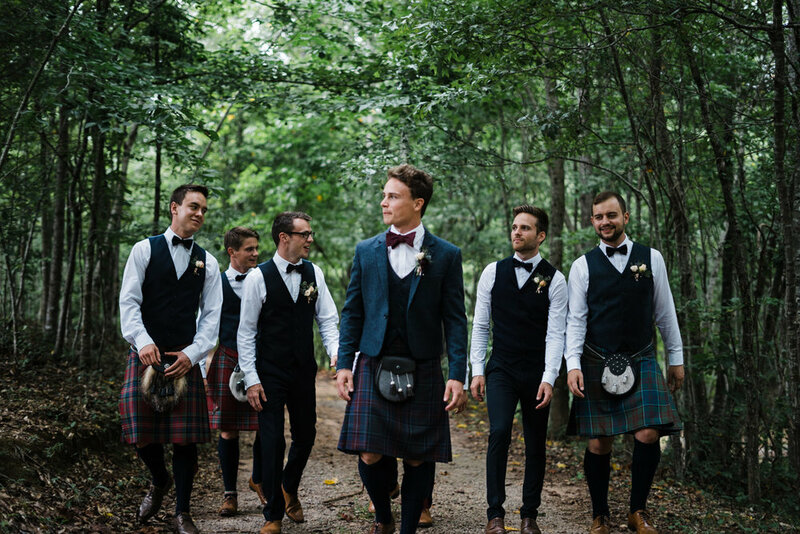 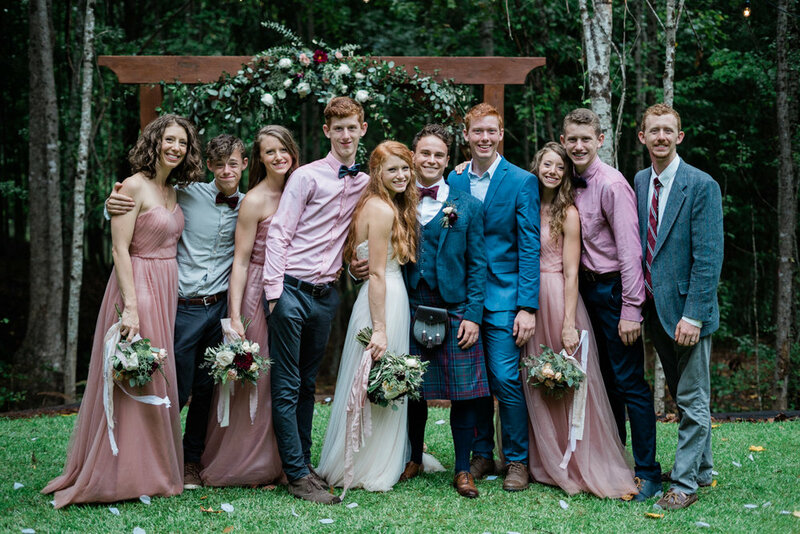 Their wedding had all of the best of both worlds - kilts, bagpipes, homegrown flowers, cheese grits, mashed potatoes, and a proper lesson in Scottish folk dancing. 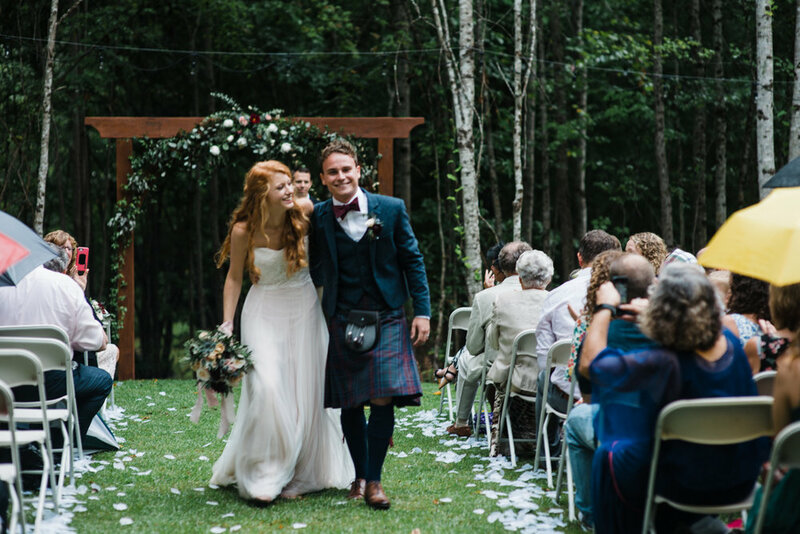 These two are adventurous, hospitable, and just downright sweet. 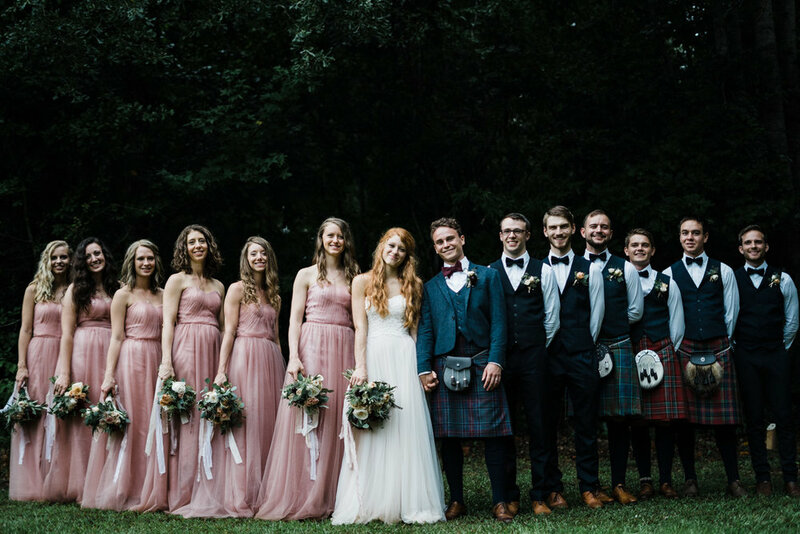 We finished up the bridesmaid and groomsmen portraits just in time to run inside to escape a momentary downpour, and it felt like the skies had parted just in time for us to get all of the photos we needed. 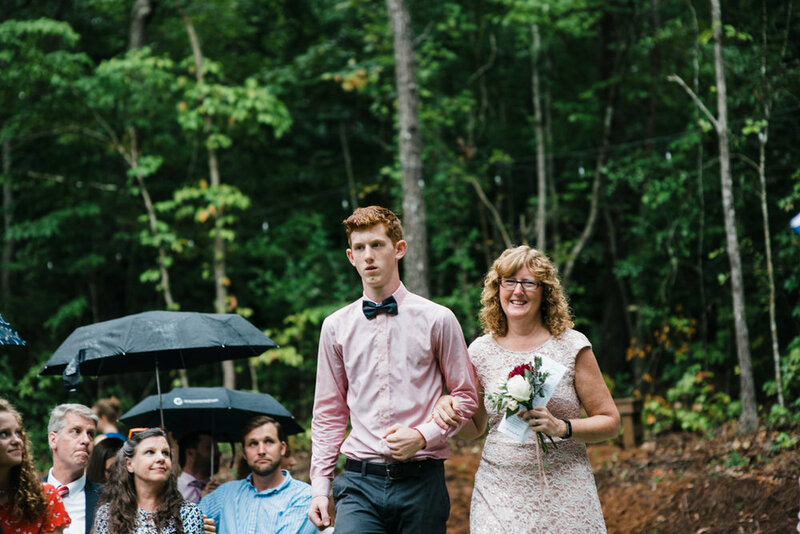 We were all on our toes, saying prayers the rain would hold off during the ceremony. 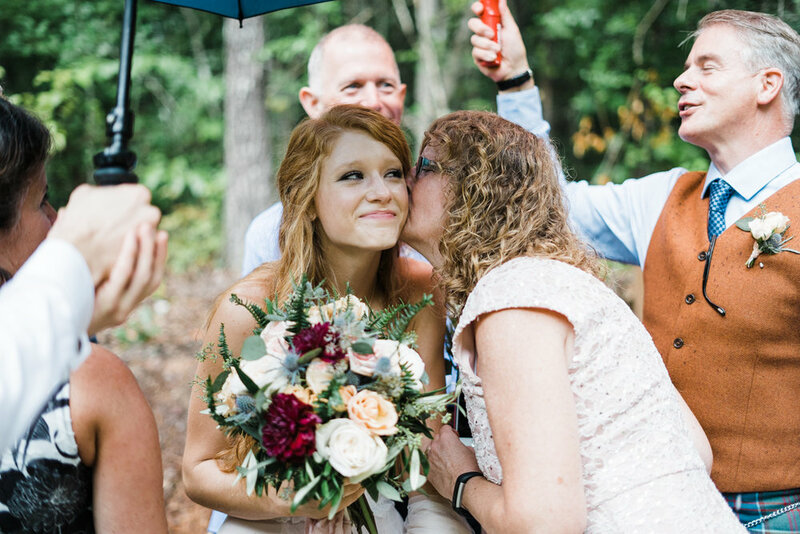 When 5:00 rolled around and it was still sprinkling, we put up our umbrellas, wrapped up my gear, and had the most delightfully romantic ceremony in the beautiful summer rain. 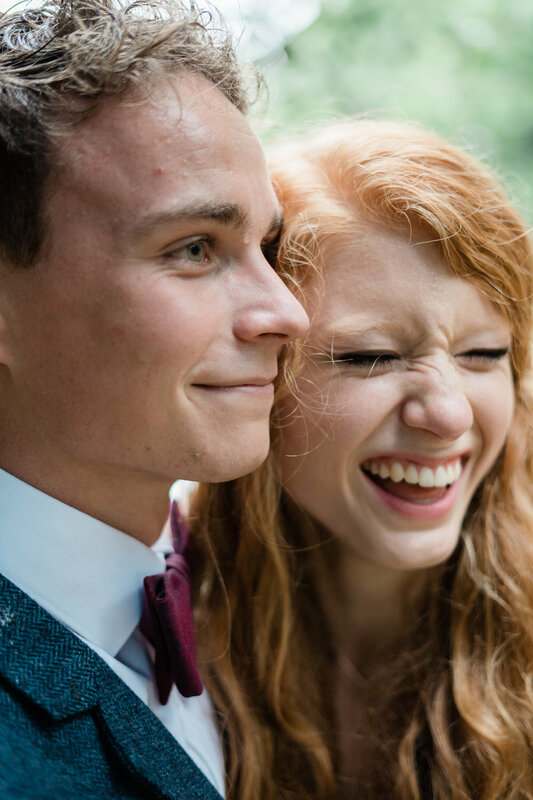 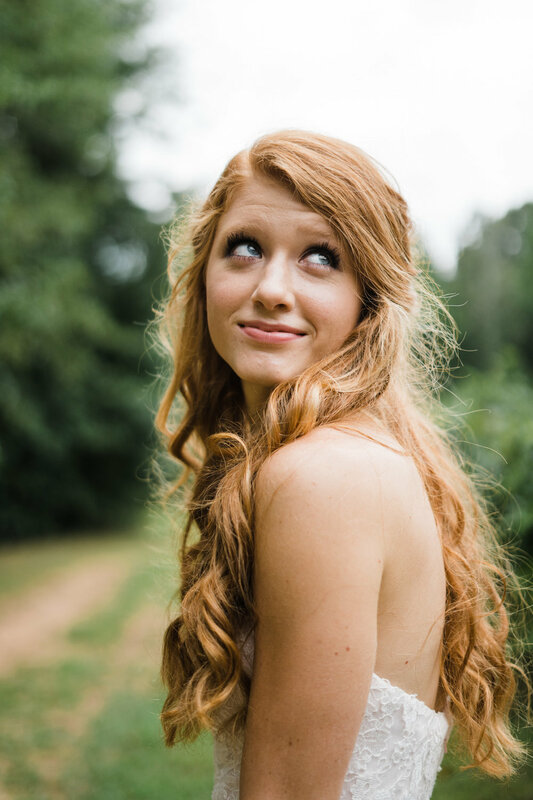 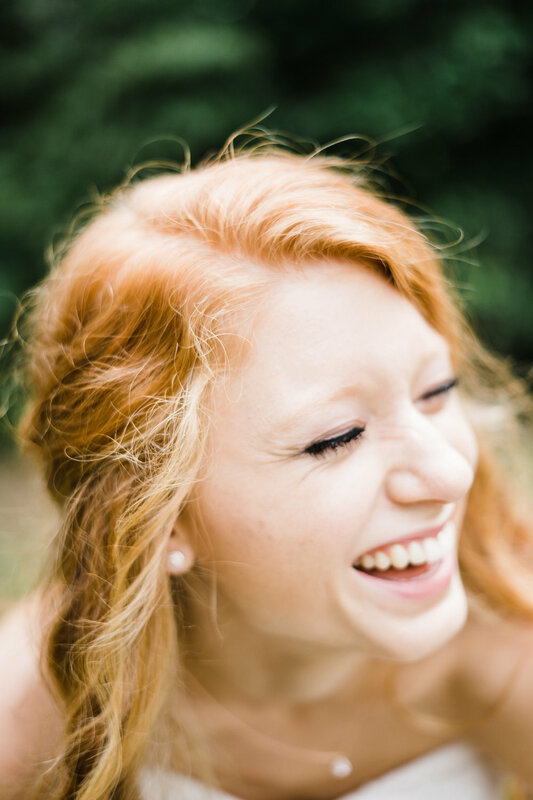 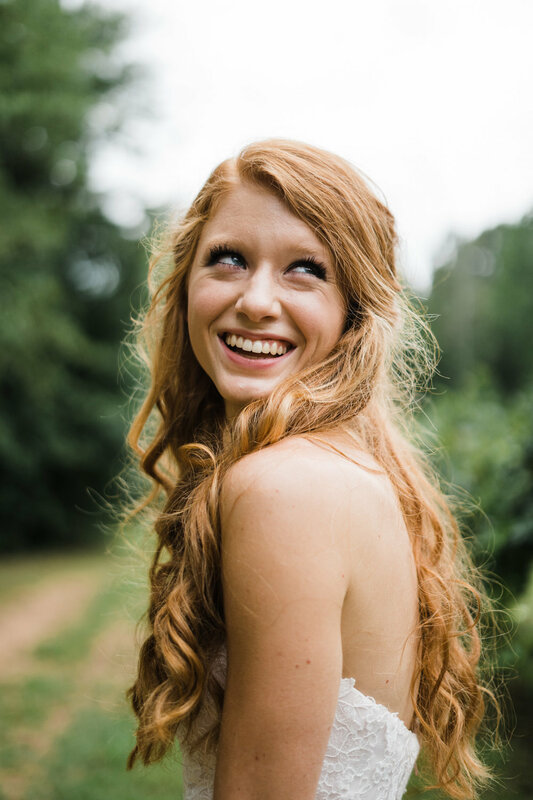 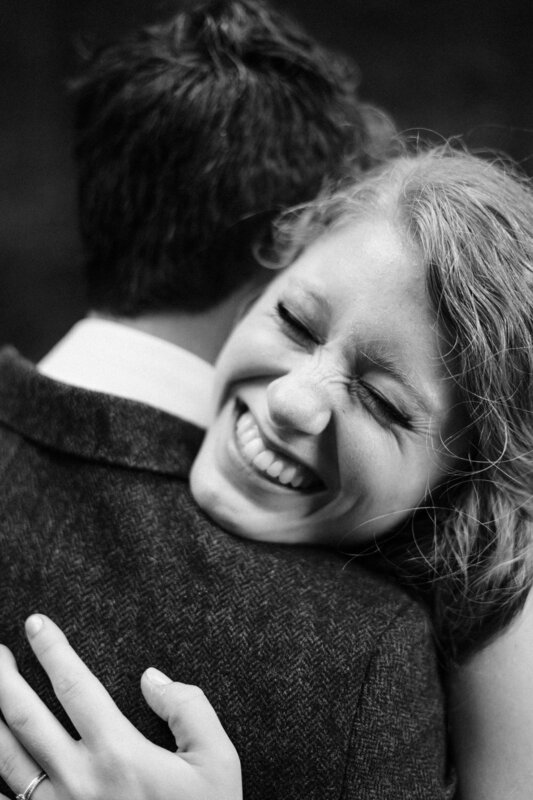 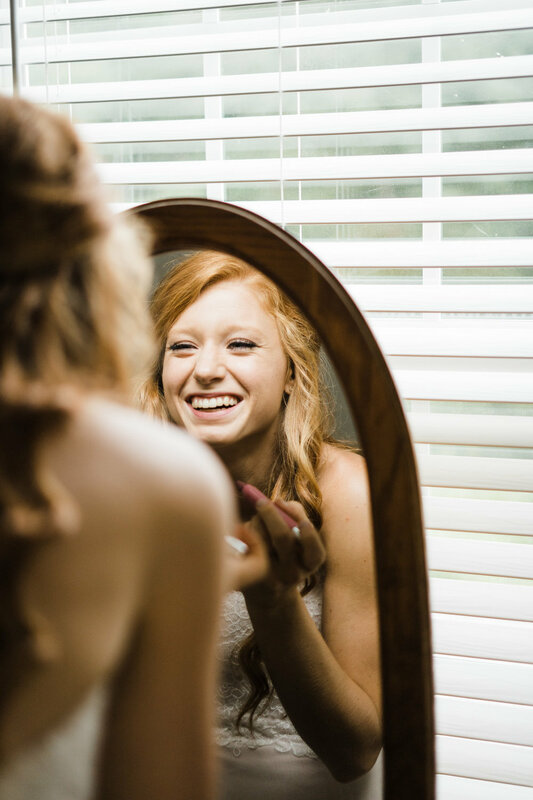 Grace and Alex's joy shined right through as they got soaked during their portraits. 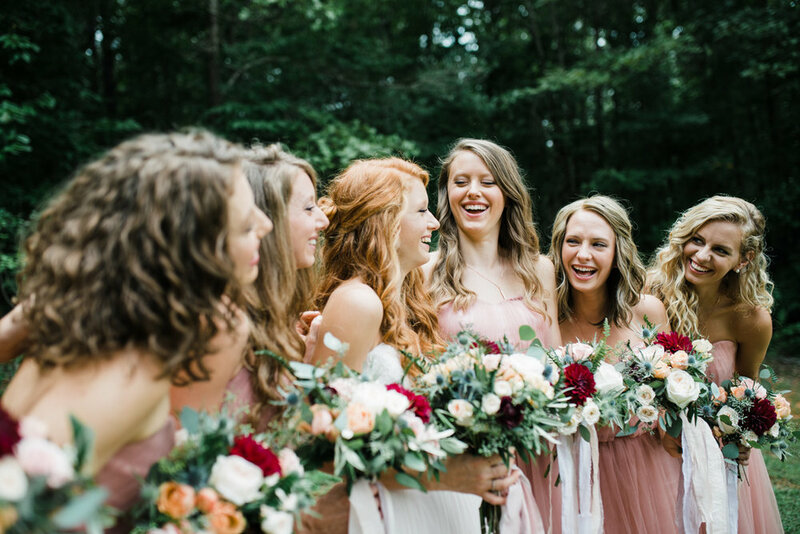 They laughed, and spun around, ran through the fields, and enjoyed each other so well. 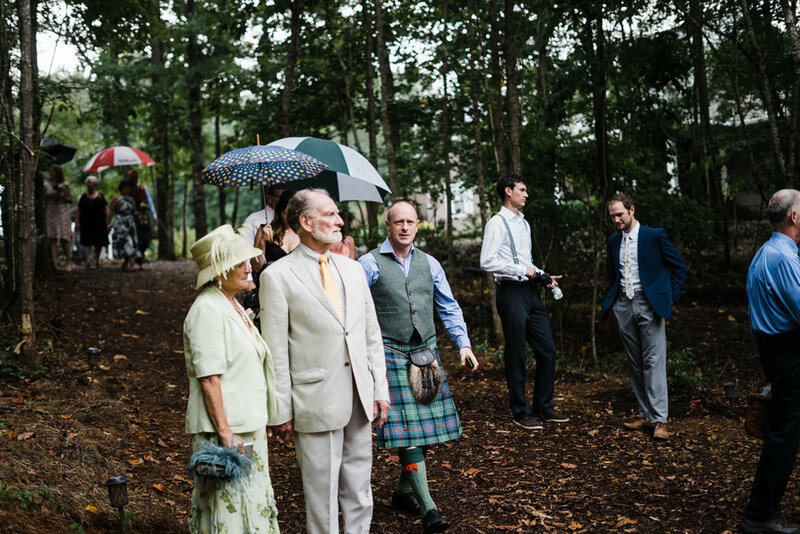 Rob chased behind me with the umbrella, carrying all of my bags, and really giving every ounce of help he could. 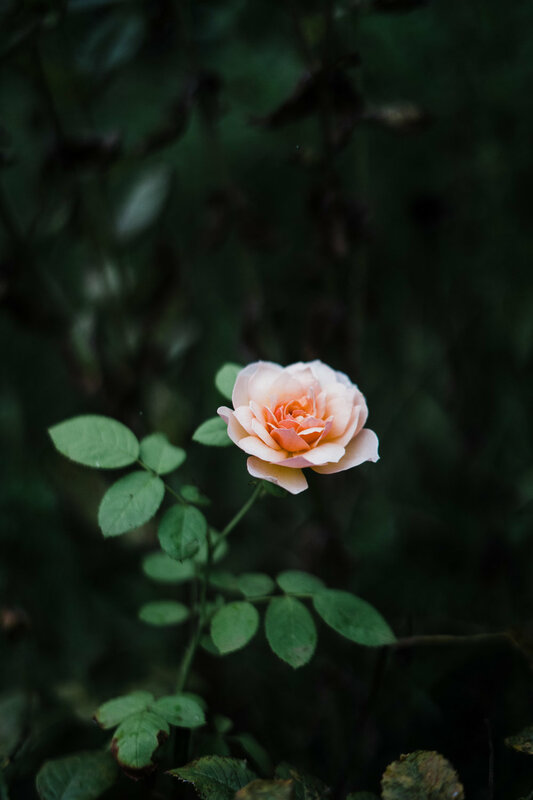 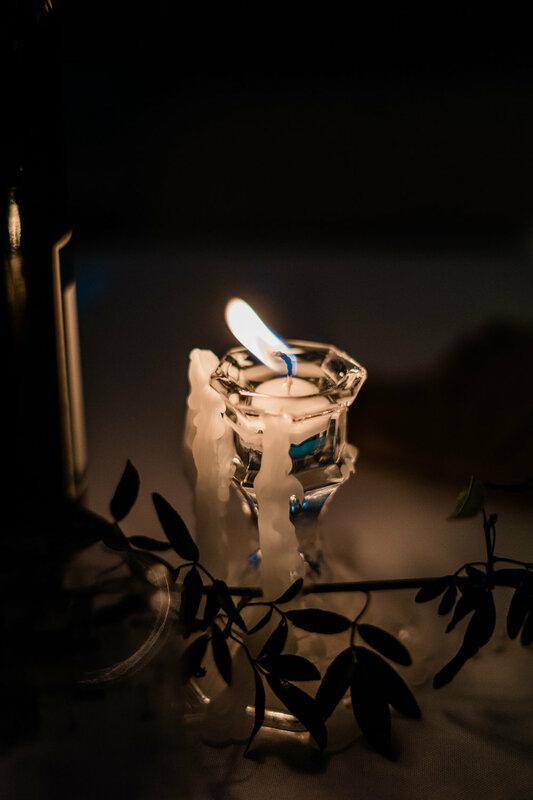 (Thanks a million, my love.) 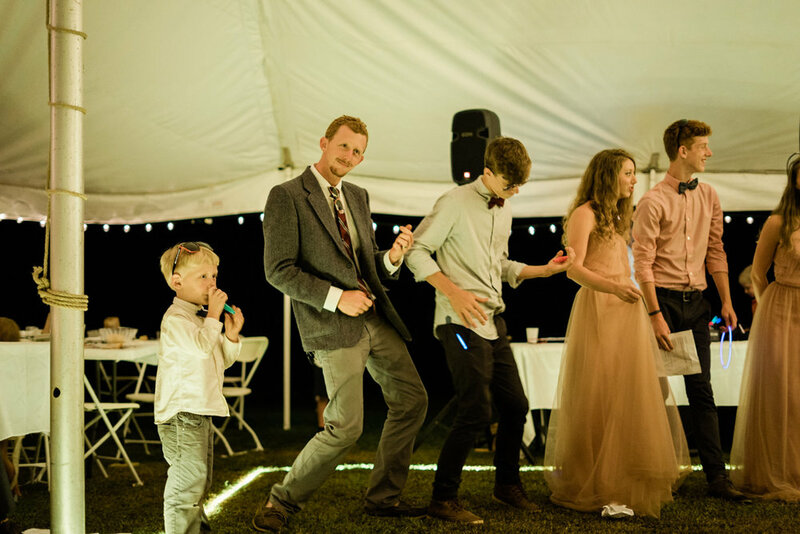 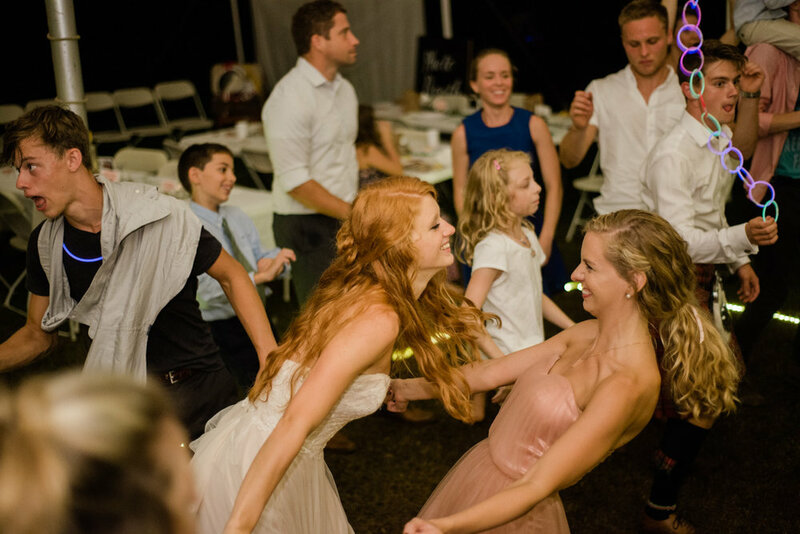 Their reception was a wonderful collaboration of cultures and stories and it was such a delight to dance the night away with them. 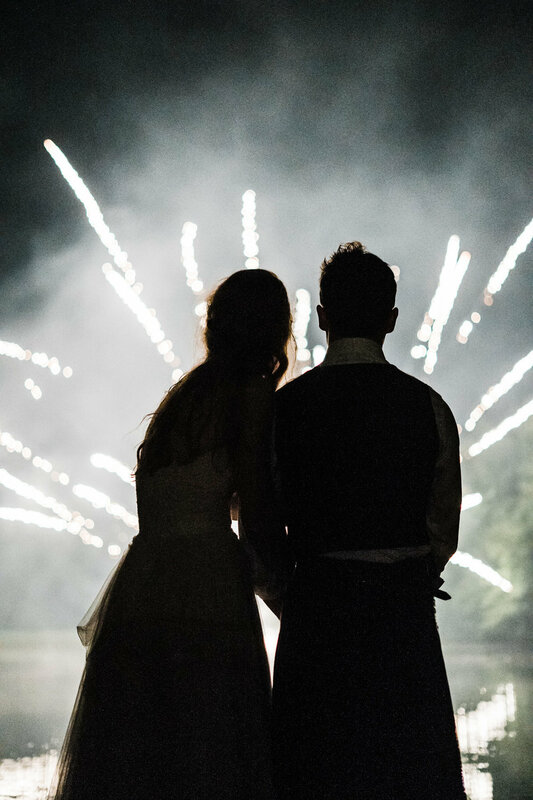 To top it all off, Grace's brother shot off fireworks over their lake and it was a dreamy, tender moment to finish the day. 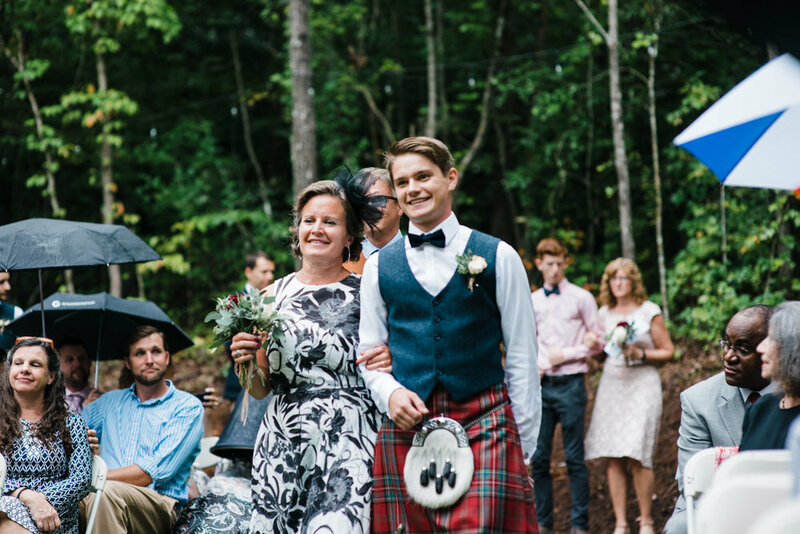 I'm grateful for the love and hospitality I got to witness with you all. 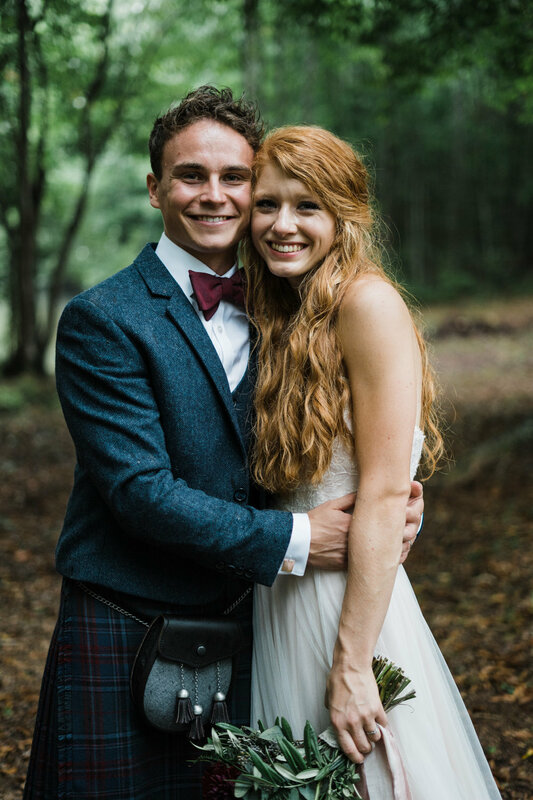 Thanks for choosing me to celebrate with you!